ALBION – Orleans Hub will have our annual awards presentation today for our choices of the “outstanding citizens” for 2018. We’ll be presenting certificates and thanking people who stepped up in a big way last year to make the community a better place to live. We’ll be recognizing Tami Ashton, Mark Bennett Sr., Penny Cole, Michael Hungerford, Jak Kohmann, Melissa Ostrom, Leonel Rosario, Tony and Laura Sidari, Brett Sobieraski and Chris Wilson. This event starts at 6:30 p.m. and is at Hoag Library in Albion. The public is welcome to attend, although space is limited. We’ll likely post a video of the awards presentation on YouTube. Every year since the Orleans Hub started in 2013 we’ve honored a group of people who made Orleans County better in the past year. In Orleans County, we are fortunate to have many people dedicated to good works and improving the community. Sometimes they react in the spur of the moment, saving another person’s life. Sometimes it’s years of effort before they see the fruit of their labors. And, sometimes after suffering a painful personal tragedy, they will step forward to help others. The steady drumbeat of depressing news can often give a warped view of the community, country and world by fixating on bad things. It can be very discouraging. 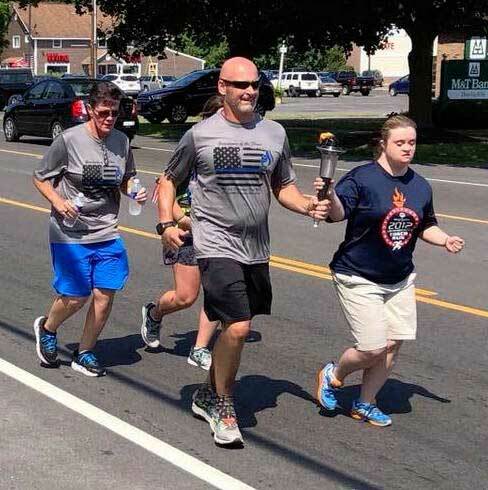 Provided photo: Brett Sobieraski runs the final stretch of a 50-hour journey on July 15, carrying a torch for the Special Olympics. He started in Buffalo on July 11 and would run more than 6 1/2 consecutive marathons in six different counties. He finished the challenge at the State Police Trooper Barracks in Elbridge, a town in Onondaga County, west of Syracuse. Sobieraski, sergeant with the Rochester Police Department, ran more than 6 1/2 consecutive marathons in six different counties. He turned 52 while he was running the 50 for 50. He has completed other endurance challenges including the 135-mile Badlands ultramarathon through Death Valley and has swum 32 miles across Lake Ontario. 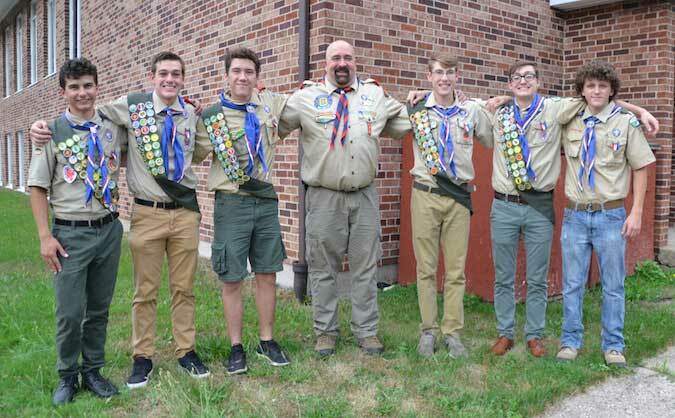 Photo by Tom Rivers: These six Boy Scouts are pictured with Scoutmaster Jak Kohmann on Aug. 1 at a Court of Honor celebration at the Disciples United Methodist Church in Clarendon. Pictured from left include: Xander Apicella, Matt DeSimone, Dalton Thurley, Jak Kohmann, William Harrington, Jake DeSimone and Ben Downey. Jak Kohmann has set a standard of excellence for Troop 59 in Clarendon. In the past 16 years, 32 of the Boy Scouts in the troop have earned their Eagle rank, the highest level in Scouting. On Aug. 1, six Scouts were presented with the rank during a Court of Honor celebration. They include Xander Apicella, Matt DeSimone, Dalton Thurley, William Harrington, Jake DeSimone and Ben Downey. Kohmann was praised by the Scouts and parents for his commitment and guidance to the Scouts, especially since his son aged out of the program about a decade ago. His son Derek Kohmann, 27, was the third of the 32 scouts to earn his Eagle under Jak Kohmann. Kohmann worked 30 years at Kodak and then another eight years at the Holley Pharmacy until he retired in April. He said scouting provided a needed break from the stresses of his job. The Clarendon troop also has many engaged parents and several active volunteers. Kohmann does the paperwork after the scouts earn their badges and ranks. Eagle Scouts need to earn at least 21 merit badges, but many of the scouts in Clarendon go well beyond that. 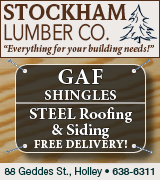 They have completed projects at Hillside Cemetery, the Clarendon Historical Society, Clarendon Fire Hall and the town park. The projects need to take at least 100 hours, but Kohmann said the Clarendon Scouts put in at least 150, with some taking 400 hours to complete. John Crandall, the assistant Scoutmaster the past nine years, said Kohmann sets the tone in the troop, and keeps the scouts engaged. Photo by Tom Rivers: Tony and Laura Sidari are pictured on Aug. 27 on a visit home to Albion. Tony is holding son Tristan, 2, while Laura is holding son Cameron, who was 9 months old at the time. Albion natives Tony Sidari and the former Laura Lyman suffered the tragic loss of their son Leon, 4 1/2, on Christmas Day in 2017. Leon died two days after getting the flu. He was a very healthy and happy boy. The Sidaris were living in San Antonio for six years before moving recently to Dayton, Ohio. They said Leon was very healthy and started showing flu symptoms on Dec. 23. Within 48 hours he died despite the efforts of a medical team at the hospital. Leon had been vaccinated for the flu in prior years and was due for a flu shot soon after Christmas. He died from the strain of the virus called H3N2. The Sidaris say young, healthy children can be ravaged by the flu. They are encouraging all children, 6 months or older, to be vaccinated. Parents should have the children vaccinated every year to build their immunity in fighting off the flu, the Sidaris said. They urge children to be vaccinated early in the flu season in September or October. “The flu shot reduces the risk of severe complications,” Tony said during a visit to Albion in August. Tony and Laura grew up together in Albion, attending the same preschool. Tony graduated from Albion in 2003 with Laura finishing Albion a year later. They were in the marching band together. They started dating at Cornell University. They both earned licenses as medical doctors with Laura working as a psychiatrist and Tony as a rheumatologist. They are both in the Air Force. 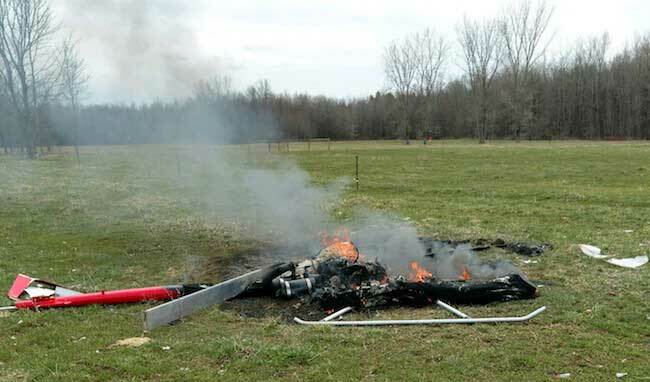 Photo courtesy of Dirk Climenhaga: This helicopter crashed on April 24 and burst into flames on Route 279 in Gaines. Bennett pulled over to watch the aircraft, which was flown by Alan Heard, 64, of Waterport. Something went horribly wrong with the Mosquito XE and it crashed. Bennett reacted quickly. He climbed through an electric fence and ran to the crash site. The aircraft had burst into flames. Heard was on fire. Bennett cut Heard’s shirt off, rolled him over to put out the flames and pulled him from the wreck. 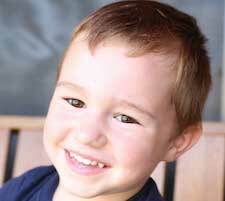 Law enforcement said Bennett saved Heard’s life. They praised his quick actions. Dirk Climenhaga lives next to the field when the helicopter crashed and called 911. He was the second person on the scene. “Mark is a hero,” Climenhaga said. Photos by Tom Rivers: Michael Hungerford had the vision and drive for the big art show at the former Medina High School. Michael Hungerford read about a vacant warehouse in New York City that was turned into art installations. The event drew huge crowds to the warehouse, and pumped energy into a site that had seen better days. Hungerford works as regional director for Takeform in Medina. As he read about the success of the art project at the New York City site, he envisioned a similar project in Medina. The former Medina High School was vacated over the summer, the MAAC Clothing Store and Calvary Tabernacle Assembly of God Church moved out. Hungerford’s uncle Roger Hungerford is planning to renovate the former school into apartments. But first he is focused on restoring the Bent’s Opera House on Main Street. Artists were given free rein to create in old classrooms, stairwells, hallways and other space in the school. Virginia Melynk of Buffalo is shown with her creation using triangular shapes made out of spandex that utilize geometric patterns. 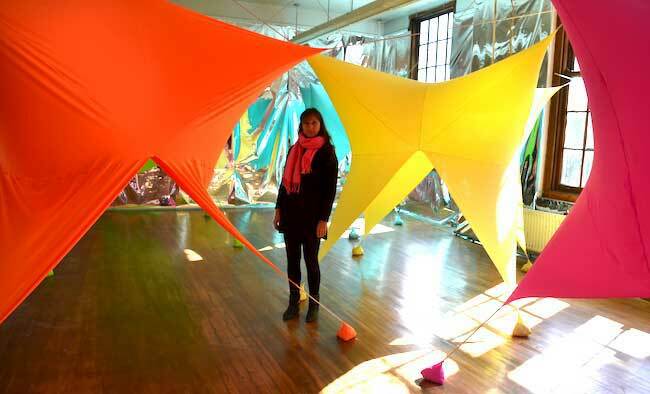 She was one of 29 artists featured in a major art show at the former Medina High School. Artists submitted proposals to be included in PLAY/GROUND. Hungerford worked with gallery owners in Buffalo to coordinate the exhibits. The three-day show drew many people to Medina who had never been to Orleans County. Michael Hungerford is hopeful some of the visitors, including the participating artists, will help build an arts culture in the Medina community. 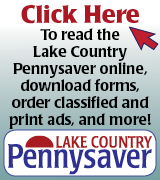 The low-cost rents in the Medina area may also appeal to the artists and some may decide to live and work in Orleans County. Penny Cole, center, has organized several benefits for the Ronald McDonald House in recent years at Holley. She is shown on March 12 at a charity basketball in Holley between school staff and law enforcement officers in Orleans County. She is reading off the winning ticket in a 50-50 raffle. Matt DeSimone, left, is a Holley student who served as announcer for the game. Julia Buck, the cheerleader, was hospitalized for five days in Rochester in the summer of 2017 after a boating accident at Brockport. Her mother was able to stay in the Ronald McDonald House. Penny Cole is a dynamic presence at Holley’s Junior-Senior High School. She works as a secretary in the guidance department. She also is a dedicated cheerleading coach in Holley. She inspires her cheerleaders to perform their intricate and athletic routines. They have won several Genesee-Region League titles. Penny Cole and her daughter Heather Kelley, co-coaches of the Holley varsity cheerleading team, are pictured with “The Little House That Love Built” in March 2017. The house was taken to the Ronald McDonald House in Rochester. The cheerleaders also do many community service projects, including visits to local nursing homes. Cole has become a passionate fund-raiser for the Ronald McDonald House. She engages the entire school community in her fund-raising efforts, whether it be a charity basketball game with numerous gift baskets, or a the chance to buy a shingle on a doll house. 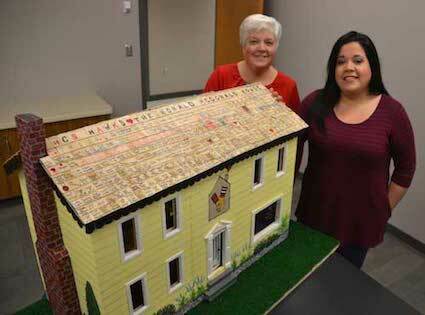 That doll house – The Little House That Love Built – netted $2,050 for the Ronald McDonald House in 2017. The refurbished mini-house is displayed at the Ronald McDonald House in Rochester. The Ronald McDonald House provides a place for families to stay while their children are hospitalized. Penny Cole has organized several benefits for the Ronald McDonald House in recent years at Holley. In March she was honored with a community service award from the Ronald McDonald House. The event raised $4,444, by far the most in the 12 years Holley has been raising money for the Ronald McDonald House. Melissa Ostrom’s book, published by Macmillan, highlights courage of pioneers who settled in WNY. Melissa Ostrom of Holley wrote a book published by Macmillan in March that honors the courage and resourcefulness of pioneer settlers in Orleans County and Western New York. In The Beloved Wild, Ostrom brings life to pioneer characters. The pioneers were typically just teen-agers when they set out from New England to brave a hard journey by wagon, through dense forests, to get to Orleans County and Western New York. There wasn’t a map. The pioneers followed markings on trees as they made their way west. The pioneer settlers were incredibly resourceful in taming the land, building homes and farms in the frontier. The obstacles were many – sickness, uninvited strangers, alcoholism, abuse. 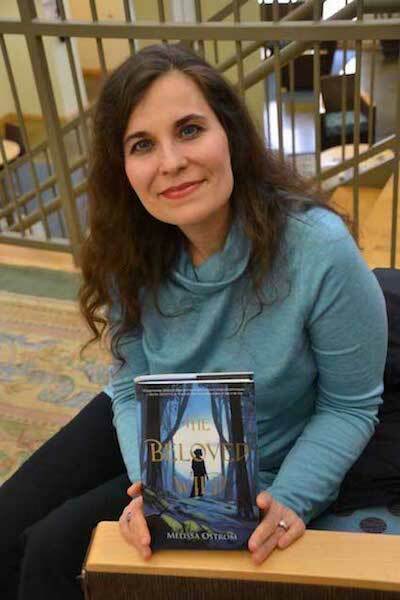 The Beloved Wild is a debut young adult fiction novel. Harriet Winter is the main character in the book. She is expected to stay home in New England and cook and tend to her younger siblings. She refuses. She disguises herself as a boy and joins her brother on the epic trip to the Wild West – the Town of Gaines. 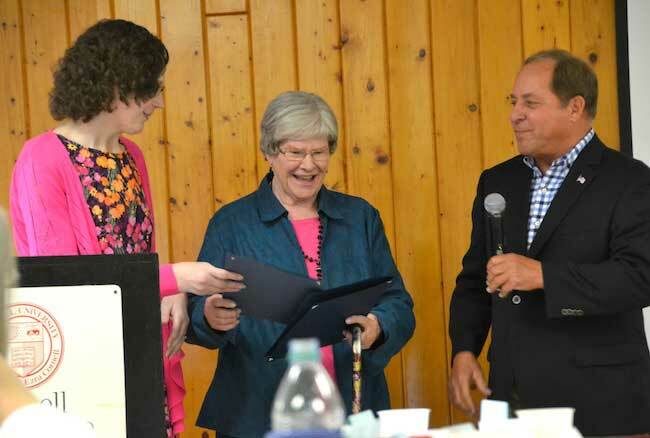 Ostrom was honored on April 26 by the Orleans County Historical Association for her work in helping so many people to better understand and appreciate the pioneer settlers. 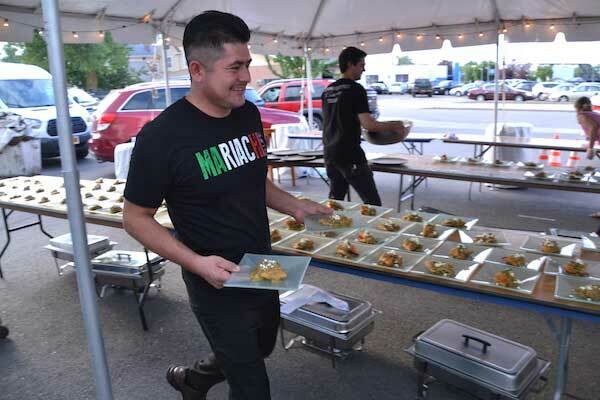 Leonel Rosario, chef and co-owner of Mariachi de Oro Restaurant of Medina, helped prepare and serve food on Aug. 2 during the third annual Farm-To-Table dinner in Medina, which included a record crowd of 220 people. “I love being a part of the community and working together with all of the other businesses,” Rosario said. Leonel Rosario has worked with his family to create a popular Mexican restaurant on Maple Ridge Road in Medina. Mariachi de Oro Restaurant of Medina draws people from all over Western New York, and has received many glowing reviews in The Buffalo News and other publications. Mariachi de Oro in 2017 was named “Business of the year” by the Orleans County Chamber of Commerce. 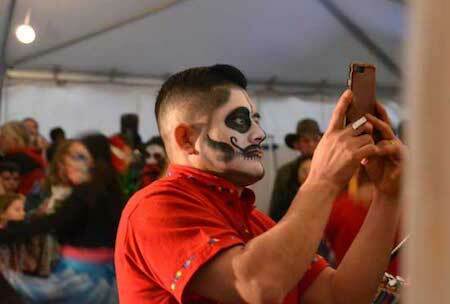 Leonel Rosario takes a photo of the ofrenda he created for the Day of the Dead celebration in downtown Medina on Nov. 1. Several of his family members were part of the occasion, dancing and preparing food for the community. This year on Nov. 1 he helped organize a Day of the Dead celebration, which for the first time was in downtown Medina. Rosario previously hosted a scaled-down version of the Day of the Dead at Mariachi. Moving it to the downtown was a way to include Main Street businesses and have more room to share food and the festive dances. Rosario created an ofrenda, an altar that is intended to welcome returning souls. Rosario made the ofrenda in the style of his hometown in Oaxaca, Mexico. The large display featured candles, wild marigolds, incense, photographs, mementos and loved ones’ favorite foods like fruit, tortillas, tamales, chocolate and bread. The event on Nov. 1 was a chance to learn about and enjoy the Mexican holiday, which is a time of joyful remembrance of deceased loved ones. Rosario also is active in the very popular Farm-To-Table dinner in downtown Medina. Rosario has worked with Michael Zambito of Zambistros the past two years with the fine dining experience. This year it was expanded to include Mile 303, Sourced Market & Eatery and The Shirt Factory Cafe. Rosario is generous with his time and can be counted on to enthusiastically join with others for community events. 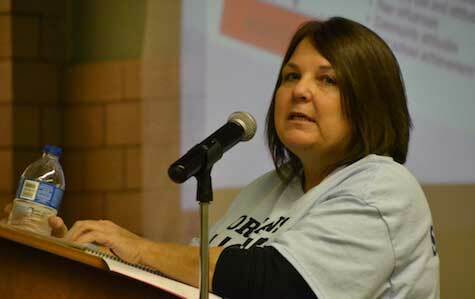 Tami Ashton speaks during a community event about some of the services available to help people fighting addiction. Tami Ashton of Medina knows the pain of losing a loved one to addiction. Her daughter, Christina Ashton, died from a drug overdose on June 27, 2016. Christina had been clean for 19 days. Her mother left the house for a 40-minute errand. When she came back, she found her daughter slumped over and not breathing in Ashton’s backyard. Someone dropped off heroin and her daughter took all of it. Christina was 34. The group has also led community forums about addiction and helped families in crisis connect to professionals. Orleans – Recovery Hope Begins Here also has 12 trained mentors and counting to serve as recovery coaches for people with addictions. 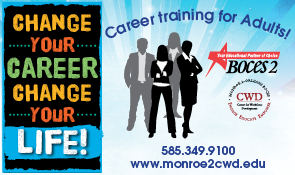 Ashton became trained to be an addiction recovery coach for the Genesee/Orleans Council on Alcoholism and Substance Abuse. She encourages people to be honest about the drug crisis in their own lives, their families and communities – and to then seek help in fighting the addictions. “It’s killing our children and destroying our families,” Ashton said. 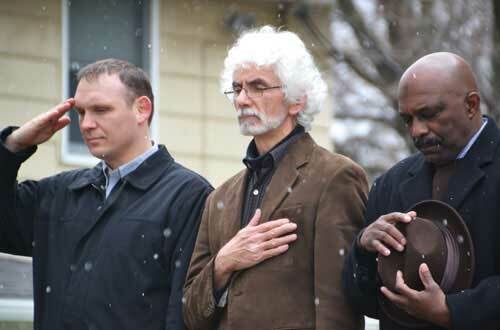 Some members of the World Life Institute including Chris Wilson, center, stand at attention after raising the American flag on April 2, 2016 when the organization held a dedication service for The Colonnade, the former Medina Masonic Temple at 229 West Center St. The Colonnade is the world-wide headquarters for World Life Institute, which runs humanitarian and educational programs in several countries. These WLI members Chad Scott, left, and Ameen Ghani, right, both served in the military. Wilson served as World Life’s international director of the Project Life program. That program has hosted about 130 children from war-torn Bosnia, Afghanistan and Chechnya for a summer of peace and education. Orleans County and the world lost a man dedicated to peace and serving children from war-torn countries on May 28 when Christopher Wilson died after a brief battle with a rare form of cancer. Wilson served as international director of Project Life, which brought about 130 children to Orleans County for a summer of recuperation. The children stayed with local host families, including with Wilson and his wife Deborah and their son Samuel. The kids learned English, visited many tourism sites, and mostly had care-free summer days. Three of the children had medical issues and needed to stay longer. Wilson worked out medical plans for each of them, arranging for their care and donations. Wilson was a high-energy and compassionate person, who wouldn’t be discouraged even when the task seemed insurmountable. He was diagnosed with a rare cancer in April and died about a month later. From his hospital bed he sent emails from his laptop, advocating for children. Wilson stayed in contact with many of the children in the program. They have become leaders in their countries now that they are adults. He was also instrumental in the World Life Institute’s purchase of the former Masonic Lodge on West Center Street in Medina. That building in 2016 became The Colonnade, the world-wide headquarters for World Life Institute. The Colonnade has hosted educational programs, including a five-part lecture series on global nuclear awareness. Project Life had a 20th anniversary celebration on Aug. 16, 2017 at the WLI school on Stillwater Road in Waterport. The WLI building has been used for numerous art classes and other programming for the children the past two decades. There have been numerous intense soccer games played in the backyard. A big group of former host families and other program supporters attended the anniversary gathering. Wilson was among the speakers. Orleans Hub will have an awards program to recognize the Outstanding Citizens in early 2019. MEDINA – Orleans Hub held its annual awards program this evening at Lee-Whedon Memorial Library in Medina. 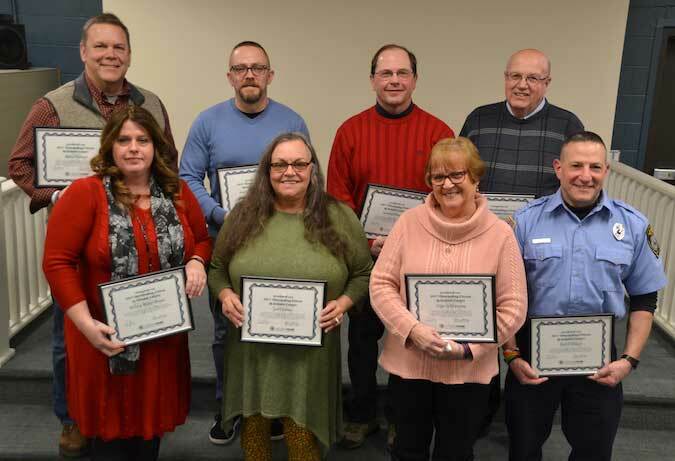 The Hub recognized eight residents as “outstanding citizens” for their efforts to better the community. Front row, from left: Krista Wiley-Neale, Lori Laine, Cheryl Maxon (representing her son, Dan Schiavone), and Peter Sidari. Back row: Pastor Mike Outten, Andrew Szatkowski, Jerome Pawlak and David Green. David Green: The retired Orleans County sheriff has remained an active community member in his retirement. 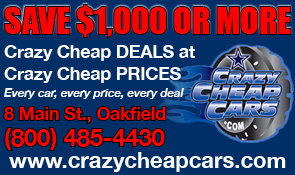 For nearly 20 years he has been a key leader in a classic car show, which runs about 10 weeks in Medina. The car shows draw about 100 cars on a typical Friday. The “Super Cruise” brings about 300 cars when Main Street is closed off and Elvis impersonator entertains. Green also remains an active volunteer with the East Shelby Volunteer Fire Company and helps organize East Shelby’s annual swap meet at fairgrounds, which usually raises $5,000 to $10,000 for fire company. 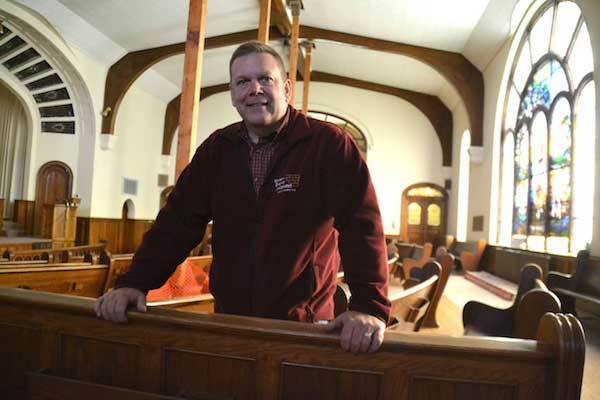 Mike Outten: The pastor of North Point Chapel in Albion led his congregation in its move to the former United Methodist Church building in Albion. The building has found new life with the congregation, which has started new ministry programs while keeping a historic structure intact. Krista Wiley-Neale: A veterinarian who owns Wiley’s Ark Animal Care in Holley was key in restarting the Holley June Fest and also in expanding the Festival of Lights in December. Wiley-Neale also serves on the Village of Holley Development Corporation Board which was able to complete the sale of eight “Diaz homes” in 2017. Those houses will be returned to the tax rolls after about 15 years of being vacant. Wiley-Neale also is a member of the Holley Rotary Club, which tackles several community projects each year. 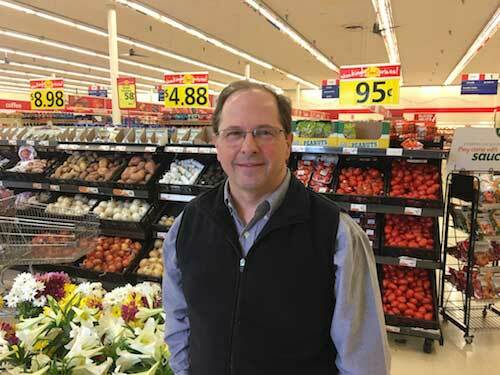 Jerome Pawlak: The long-time grocer has been generous to numerous community efforts over the years, while also serving on the boards of directors for United Way, the Chamber of Commerce, the Orleans Economic Development Agency and many others. He has coached Little League, youth basketball and been an active member of his church. Peter Sidari: The county’s Emergency Management Office received a $75,000 grant for a new fire safety trailer last year. Sidari, an Albion firefighter who works as a fire safety educator for the North Greece Fire District, was key in picking out the design of the new trailer and insisting on kid-friendly decals and characters on the trailer that serve as a billboard, helping to reinforce the message of having a fire escape plan. Many firefighters served on the committee to design the trailer. Sidari was key to the effort, including the training of 42 volunteers who will lead kids through the program. Dan Schiavone: The Holley dentist served as chairman of a village-created development corporation that took possession of eight homes from the federal Environmental Protection Agency and then resold them. The organization had a big breakthrough in 2017, getting the EPA to relinquish eight houses that had been off the tax rolls for about 15 years. The EPA took ownership of them after a chemical leak in January 2002 at the former Diaz Chemical. Schiavone worked with the EPA, a real estate company and the village officials to see the sales through completion. Andrew Szatkowski: The Medina resident organized a toy drive that resulted in about 700 gifts to be given away to children at Christmas. Szatkowski set up the donations for the Saturday after Thanksgiving, when thousands of people were in downtown Medina for a Christmas celebration, capped by the Parade of Lights. The toys were given to Community Action of Orleans & Genesee, which distributed them to families in Orleans County. Lori Laine: The Kent resident has been enthusiastic in painting rocks with kindness messages and placing them in the community, including delivering them to nursing home residents. Laine organizes rock-painting parties on Tuesdays in Albion. She has promoted community through the rocks. Laine also is an active promoter for Donate Life, urging people to be organ donors. She also spearheaded a first-time pet parade in October for Albion’s Fall Festival. 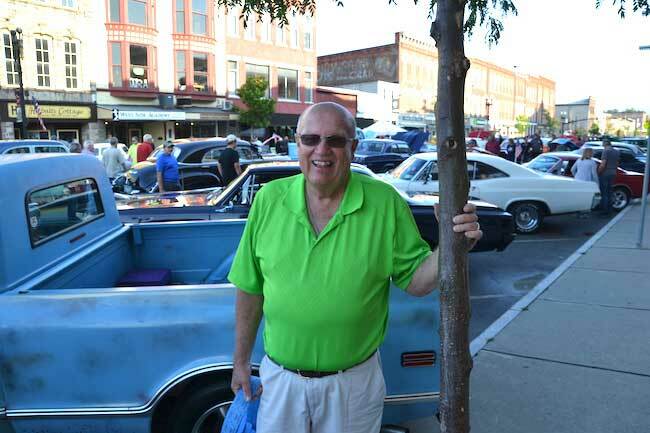 Photo by Tom Rivers: David Green is pictured on Aug. 23 during the Super Cruise on Main Street. He has teamed with Donna Bushover for about 20 years to organize the car shows. Each year since Orleans Hub started in 2013 we have named a group of “outstanding citizens.” We want to recognize people for stepping up to bring a new program or project to the community, or who have been consistent contributors for many years. Dave Green, the retired Orleans County sheriff, has remained an active community member in his retirement. 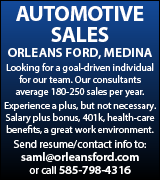 For nearly 20 years he has been a key leader in a classic car show, which runs about 10 weeks in Medina. That car show typically attracts a few hundred people to the downtown. 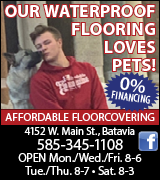 That “foot traffic” provides energy and customers for the Medina businesses, and the shows have been part of the Medina downtown resurgence. The car shows draw about 100 cars on a typical Friday. The “Super Cruise” brings about 200-300 cars when Main Street is closed off and Elvis impersonator entertains. Green also sells raffle tickets during the Super Cruise with proceeds going to the Orleans County United Way. There was some concern with the car shows earlier this year, with some merchants wanting to move the show away from the Canal Basin and Main Street, due to parking concerns. The shows went on as usual while the village considers how to resolve a downtown parking crunch – a good problem to have. Green was diplomatic and didn’t lash out at anybody when the issue was raised just before the car show season. The retired sheriff also remains an active volunteer with the East Shelby Volunteer Fire Company and helps organize East Shelby’s annual swap meet at fairgrounds, which usually raises $5,000 to $10,000 for fire company. Mike Outten, pastor of North Point Chapel, is pictured at the former United Methodist Church building in Albion in this photo from March 30. North Point Chapel moved into the site in March and reopened the sanctuary which had been condemned due to concerns about a failing roof. The supports shown in this photo were found to not be needed. A church building that is part of the historic Courthouse Square was feared doomed after the United Methodist congregation moved out of the building two years ago and the site then sat vacant with little interest from a new buyer. The United Methodists moved out after being told by engineering and architectural firms the roof was failing and would need a $1 million repair, which included strengthening the structural supports for the building. The church building is one of seven historic churches at the Courthouse Square, which is a nationally recognized historic district. Losing the church or having it sit empty would have been a blow to the district and one of the community assets. North Point held services in a Sunday School classroom until the sanctuary was reopened in December. 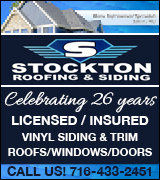 Outten, who ran a construction company, found the costly roof repair wasn’t necessary. Structural supports were buried in the insulation in the roof and weren’t seen by architects and engineers. Outten and church volunteers repainted the sanctuary, replaced numerous lights (including high ones near the ceiling) and changed the sanctuary stage, adding space for the band. Outten has insisted the past two years he’s been in Albion that he felt God had a plan for North Point to serve the Albion community. In addition to giving the church building new life, North Point welcomed two missionary teams for community service work in Albion this summer, which included a basketball camp, Vacation Bible School and work on the building. Outten and the congregation also have handled the thankless job of garbage collection during the annual Strawberry Festival. The church runs weekly Bible studies and a “Celebrate Recovery” program for people battling addictions. Outten deserves praise for seeing the good in what often appears a hopeless situation, whether an old building or people struggling with overwhelming problems. Photo by Tom Rivers: The Holley-Kendall Marching Band performs during a parade at the June Fest celebration. 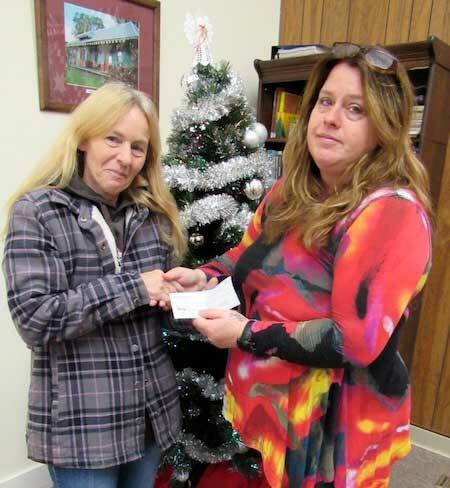 Photo by Kristina Gabalski: Holley Rotarian Krista Wiley-Neale, right, presented Marge Dale with a check $2,000 from the Holley Rotary Club to help Dale and her husband after their house burned down in Clarendon on Nov. 28. 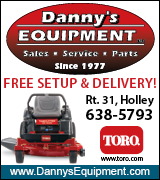 Holley took a break from its June Fest in 2016. The festival needed more volunteers and funding. Often when a community festival takes a break, it doesn’t come back. But the June Fest returned in 2017 with a big parade, 5k race, music and many other activities and vendors. Krista Wiley-Neale helped bring back the June Fest, and also was a key organizer in an expanded Festival of Lights in December. The Holley Village Board named her the “Citizen of the Year” and insisted she flip the switch during a Christmas tree lighting. Wiley-Neale, owner of Wiley’s Ark Animal Care, also serves on the Village of Holley Development Corporation Board which was able to complete the sale of eight “Diaz homes” in 2017. Those houses will be returned to the tax rolls after about 15 years of being vacant. Wiley-Neale also is a member of the Holley Rotary Club, which tackles several community projects each year. She has provided a “can-do” attitude and optimistic attitude in the village. Photo by Tom Rivers: Jerome Pawlak ended a long career in the grocery business with the closing of Pawlak’s Food Center. Jerome Pawlak lasted much longer in the grocery business than most small-town grocers. The grocery business in Albion is highly competitive with Wal-Mart, Tops, Rite Aid, Dollar General and other stores selling groceries. Pawlak endured all that competition, while being a generous supporter of numerous community organizations. He also has served on the boards of directors for United Way, the Chamber of Commerce, the Orleans Economic Development Agency and many others. He has coached Little League, youth basketball and been an active member of his church. Pawlak and his family have been “all in” with Orleans County for many years. They opened a Save-A-Lot store in Holley after the community was without a store for five years. Pawlak closed that store in September 2016 and he announced the end of his Albion business this past October. He wanted to continue but couldn’t reach an agreement for the lease in the Albion plaza. The Pawlaks have been a presence in Albion for 49 years. They started a store in Lyndonville 57 years ago before moving to Albion. 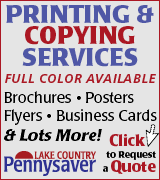 Pawlak showed resourcefulness in keeping his business going for as long as he did. In addition to the grocery store, the Albion site included The Video Station, Save-On Beverage Center and an outdoor food stand during the warmer weather. Photos by Tom Rivers: A new fire safety trailer debuted in 2017. A $75,000 state grant from State Sen. Robert Ortt paid for the trailer, which will go to local school districts and community events. Peter Sidari spoke at the Albion Board of Education meeting on Oct. 4, explaining the benefits of a new fire safety trailer and asking the Board to support a fire prevention and planning program. Fire departments in Orleans County have a new tool for teaching fire prevention and the importance of a fire safety plan. 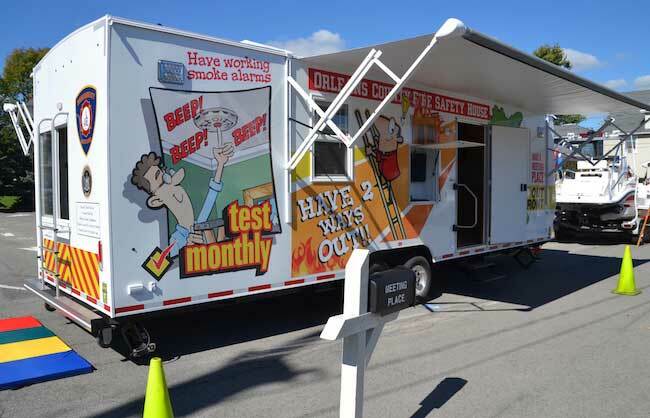 In October, a new trailer with smoke simulators and other features debuted in the county. Pete Sidari, an Albion firefighter, was among the committee members that picked out a design for the trailer and trained firefighters in leading safety programs with the trailer. 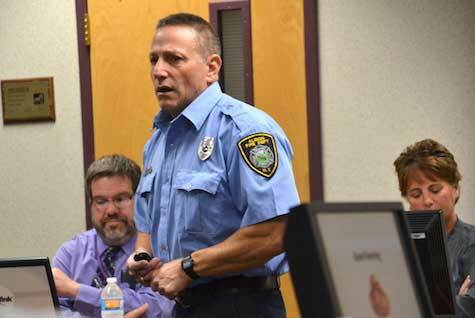 Sidari brings more than a decade of experience from his job as a fire safety educator for the North Greece Fire District. Sidari pushed for kid-friendly decals and characters on the trailer that would serve as a billboard, helping to reinforce the message of having a fire escape plan. The trailer is being used in educating the community on proper fire safety. Local firefighters have already taken it to the five school districts in Orleans County for students to practice exiting through a window in case of a fire, and to learn about smoke in a building (the trailer has a fog machine) and also to not open a hot door (the trailer can heat up doors). There have been 42 firefighters in the county trained to lead students through the trailer. Sidari said the public education program will be a work in progress. Many other communities with fire safety trailers have paid personnel who lead the program. In Orleans County, almost all of the firefighters are volunteers. Only Medina has paid staff. Many volunteers were part of the committee with the fire safety trailer. Sidari was a key to “selling” it to the local schools. He attended several Board of Education meetings and provided insight on how the trailer should be used and firefighters be trained. 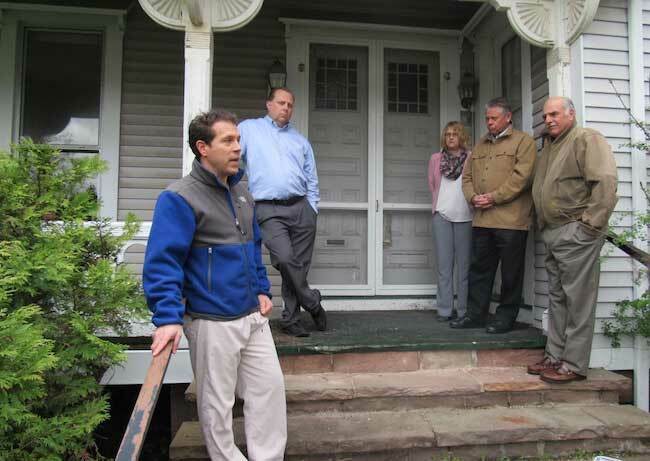 Photo by Kristina Gabalski: Village of Holley Development Corporation President Daniel Schiavone, left, is pictured on May 2 with Holley Mayor Brian Sorochty, Village Trustee Connie Nenni, and Orleans County Legislators Ken DeRoller and John DeFilipps. They are gathered on the porch of 37 S. Main St., one of eight “Diaz Homes” that Schiavone and the village worked for years to get turned over by the federal Environmental Protection Agency. It was a thankless task for Dan Schiavone: leading a village-created development corporation that take possession of eight homes from the federal Environmental Protection Agency and then resell them. 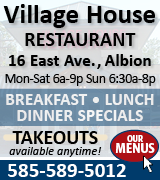 Schiavone, a Holley dentist, served as chairman of the Village of Holley Development Corporation. The organization had a big breakthrough in 2017, getting the EPA to relinquish eight houses that had been off the tax rolls for about 15 years. The EPA took ownership of them after a chemical leak in January 2002 at the former Diaz Chemical. The houses were cleaned and deemed safe although the EPA wanted assurances of lead abatement at some of the sites before they were sold. 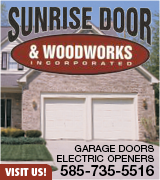 Schiavone worked with the EPA, a real estate company and the village officials to see the sales through completion. The eight houses sold for $192,600 with the EPA getting 90 percent and the Village of Holley Development Corporation collecting the other 10 percent. “It will be a big plus for the village to have them back on the tax rolls and not be eyesores in the neighborhood,” Schiavone said. He also can be counted on supporting many community fundraisers and events. The Holley Board of Education recognized his efforts in December with a “Soaring to New Heights” award. Photo by Tom Rivers: Shawn Ramsey, left, is owner of Canalside Tattoo in Medina. 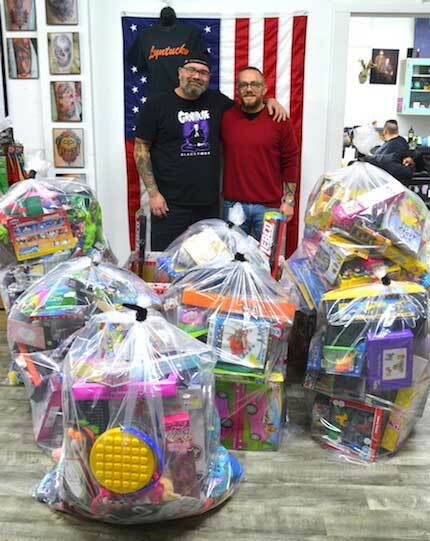 He is pictured with Andrew Szatkowski, organizer of the toy drive that resulted in 500 gifts to be given away. Andrew Szatkowski said he didn’t want any local kids to not have a present on Christmas day. Szatkowski had a brainstorm. He knew thousands of people would be in downtown Medina for a Christmas celebration, capped by the Parade of Lights, the Saturday after Thanksgiving. He urged people to drop a present at Canalside Tattoo. 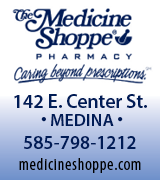 If they donated a gift or $5, they would get a raffle ticket for one of 20“Medina Experience” packages. 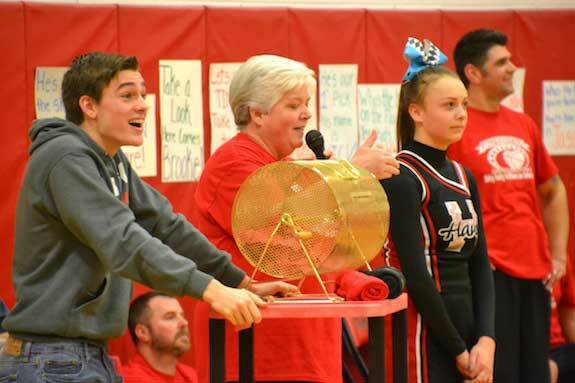 Szatkowski thought the raffle was also a way to promote Medina businesses and events. The one-day toy drive on Nov. 25 resulted in 500 toys being donated plus about $700. The toys were dropped off at Canalside Tattoo on Main Street in Medina. The toys were given to Community Action of Orleans & Genesee, which distributed them to families in Orleans County. Community Action officials said the toys were a big contribution for the agency that has 300 children on its list for Christmas. Photo by Tom Rivers: Lori Laine is pictured with two rocks that were among more than 100 delivered to residents of The Villages, the former county nursing home, during the holidays. She painted about 40 of the Christmas rocks for nursing home residents. “It’s such an easy thing to do and it makes people so happy,” she said. An interesting phenomenon took hold in Albion and many communities around the country in 2017. “Kindness Rocks” are painted, often with inspirational words and messages, and left in the community for people to find. They are encouraged to then post a picture with the rock and rehide it. Lori Laine loved the idea and organized rock-painting parties in Albion. She painted several hundred rocks, some in very intricate detail. Laine pushed the Albion “rockers” to paint rocks and take them to the local nursing home. Laine said the rocks have brought more people to Main Street, Mount Albion Cemetery and other locations in the community. She sees families with young children on rock hunts. Laine also has been an active promoter for Donate Life, urging people to be organ donors. She put together a Donate Life float for the Strawberry Festival Parade in June. Laine is committed to that cause because her husband, Tom, received a liver transplant in July 2014. Laine also organized a first-time pet parade in October for Albion’s Fall Festival. She has a big heart and makes Albion a lot more fun. 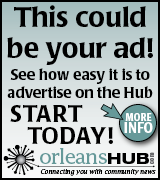 Orleans Hub will recognize the outstanding citizens at an awards program, likely in February. More details will be announced. 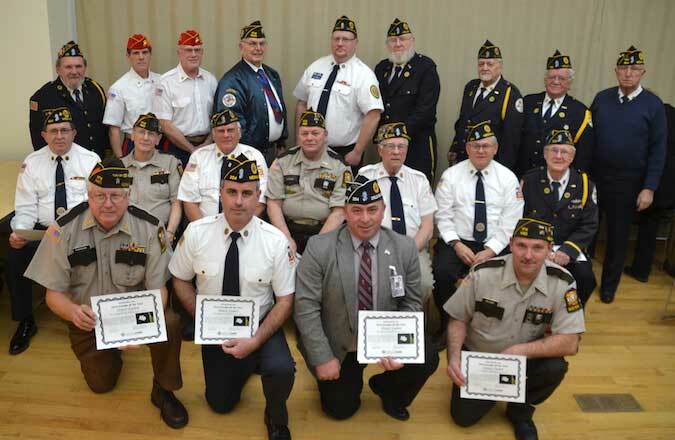 Photos by Tom Rivers: Members of the Honor Guard in Orleans County are pictured with their certificates after being named the 2016 ‘Person of the Year” by the Orleans Hub. Pictured, include, from left in front row: Dave Kusmierczak, Adam Johnson, Earl Schmidt and Eric Delano. Second row: Ken Schaal, Fred Heschke, Steve Johnson, Tony Vicknair, Frank Berger, Dave Higgins and Ron Ayrault. Back row: Gary Befus, Bryan Splangler, George Bakeman, Mike Donahue, Steven Goodrich, Bob Blosenhauer, Charles Eberhardt, Al Pulcino and Glenn Whitmore. 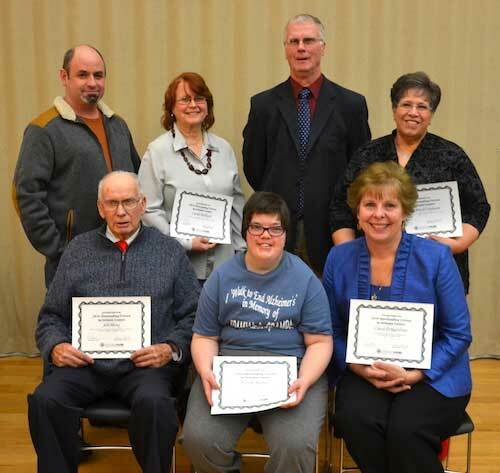 Orleans Hub recognized nine outstanding citizens on Tuesday during an awards program at Hoag Library in Albion. Pictured, front row, include: Bill Menz, Nicole Tuohey and Carol D’Agostino. Back row: Jack Burris, Linda Redfield, Wes Bradley and Holley Ricci-Canham. Missing: Chris Busch and Erik Olsen. 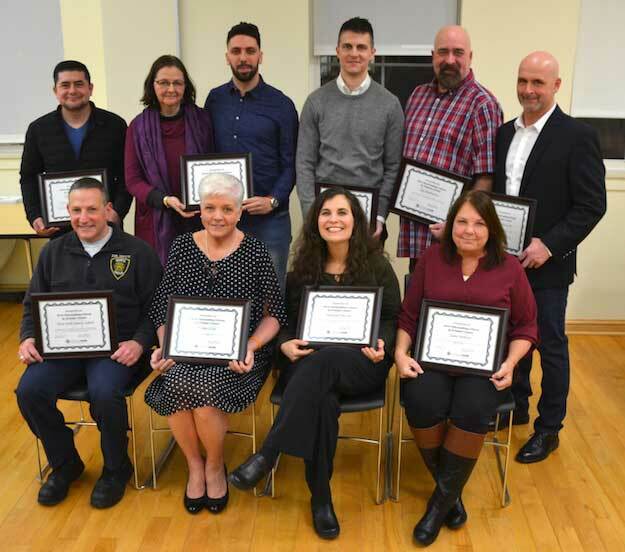 ALBION – Orleans Hub held its annual awards program on Tuesday evening and presented certificates to our annual list of “Outstanding Citizens” and also the “Person of the Year.” About 75 people attended the program at the Hoag Library. Orleans Hub Editor Tom Rivers and Publisher Karen Sawicz pick the annual winners, looking for people who make extraordinary contributions to the community. We named the “Honor Guard” as Person of the Year in appreciation for veterans who volunteer at about 100 military funerals each year. The Honor Guard provides a solemn and dignified sendoff, sometimes standing for hours in the freezing cold or blistering heat. The Honor Guard marches in parades, and attends numerous local community services – Memorial Day, the opening ceremonies for the County Fair, Sept. 11 and Pearl Harbor memorial services, and many other events. There are Honor Guards in Medina (with members from Lyndonville) and a combined group from Albion and Holley. Each group has about a dozen regular volunteers and they usually range in age from 60 to their early 90s. 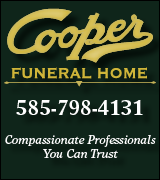 The Albion-Holley and Medina groups will often work together for a funeral. They want a good turnout to pay their respects. Many communities struggle to have enough volunteers for the Honor Guard and veterans may come in from outside the community. Orleans County still has a dedicated corps, but the Honor Guard members worry about that, especially as many of the veterans get older. Several Honor Guard leaders spoke at Tuesday’s awards program, saying they are grateful for the chance to show respect for the veterans at their funerals. Orleans Hub presented our fourth annual list of Outstanding Citizens. We picked people who have been volunteering or serving in community causes for many years. They do their good deeds for little to no pay, driven by a love for their community and neighbors. Nicole Tuohey: The Medina woman is a prolific fundraiser in the fight against Alzheimer’s. 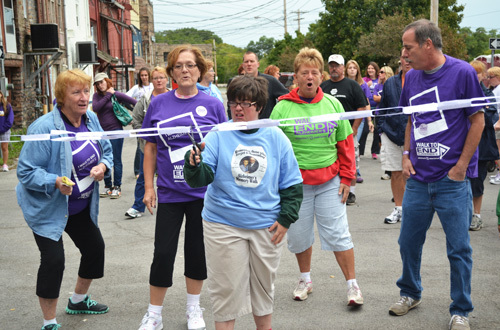 She typically raises about $1,000 each year for the “Walk to End Alzheimer’s.” Tuohey, 26, each year sells about 1,000 paper “elephant links” and creates a chain that is used to kick off the annual “Walk to End Alzheimer’s.” Nicole has Triple X Syndrome. She hasn’t let that disability prevent her from being a tireless advocate against a disease that took the lives of her grandparents, Don and Jane Bradley. Erik Olsen leads a town meeting during a recent “Old Tyme Day,” an annual celebration at East Shelby Community Bible Church. Erik Olsen: The leader of East Shelby Community Bible Church has the church dedicated outreach. Every July for the church hosts an “Old Tyme Day” celebration in east Shleby, serving pie, lemonade and hot dogs for a penny. There are horse-drawn rides, candle-making, and other activities with an emphasis on fun – and old-fashioned technology. About 2,000 to 3,000 people attend Old Tyme Day, a huge crowd for the tiny hamlet in East Shelby once known as West Jackson Corners. Church members have created a mini-village across from the church. That village also draws about 500 to 1,000 people for an old-time Christmas celebration. 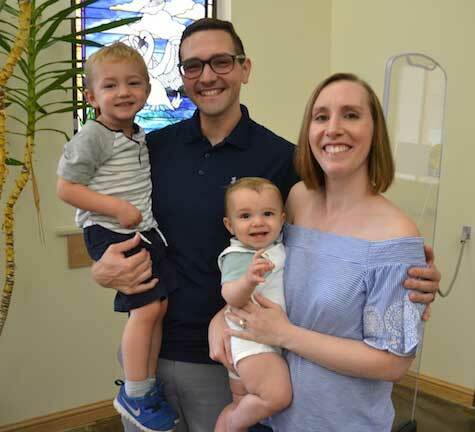 The church has been growing ever since Olsen and an initial group of 40 people started the church at a former Methodist Episcopal building in 1989. That church building had been empty for 30 years. The East Shelby Community Bible Church has grown so much – about 275 members – it has put an addition on the building. Carol D’Agostino: The Kendall Junior-Senior High School principal makes numerous community connections as leader of her hometown school. She serves on the boards for the Orleans Economic Development Agency, the Orleans County United Way and the Human Services Council of Orleans County, often bringing back ideas for Kendall to improve opportunities for students and the community. D’Agostino helped start the Kendall Innovations Committee, which brings together leaders from the school district, town government and county to brainstorm ways to promote Kendall. She is a member of the Lawnchair Ladies and led the school through a major capital construction project. Linda Redfield: The long-time ESL teacher helps students build a better life. In the past 20-plus years, Redfield has helped about 400 farmworkers learn English. Redfield started going to labor camps in 1994, before a school built by the World Life Institute became the base for classes in 1999. The school on Stillwater Road offers evening courses in English, as well as computer literacy, pottery and other programs through a partnership with the Orleans-Niagara BOCES. Several of the students attended the awards program on Tuesday. 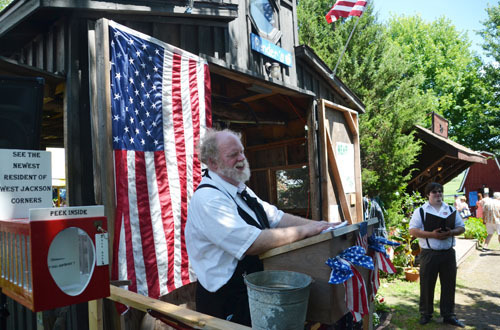 Wes Bradley: The Lyndonville resident leads the fund-raising effort that makes Lyndonvilel the place to be each Fourth of July in Orleans County. Bradley works throughout the year raising money on the big show, which tops $20,000. 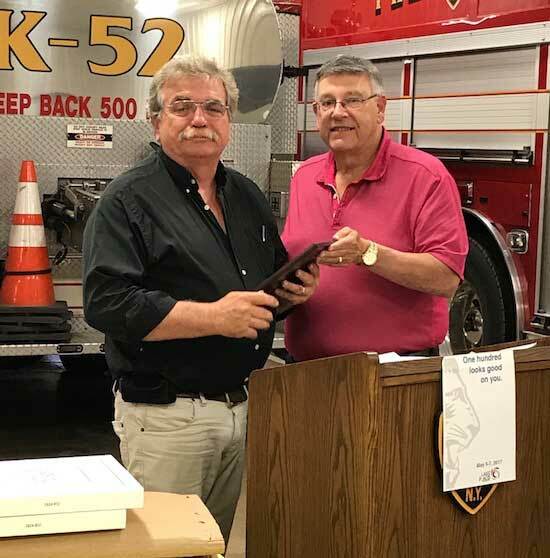 Bradley, a retired teacher, is active in the community in many ways, from serving on the Yates Town Board, to 37 years with the Fire Department and serving as finance chairman for the Lyndonville United Methodist Church. He also serves on the Lyndonville Area Foundation Board of Directors, which distributes more than $100,000 a year to community causes. Bradley also helped start Lyndonville’s annual Christmas celebration in 2013, where residents, businesses or organizations decorate Christmas trees in Veterans’ Park. That has now grown to 61 trees with the community welcoming Santa and singing Christmas carols. Provided photo: Chris Busch, right, is pictured with Ronan Tynan on Sept. 17. Tynan, one of the biggest names to perform in Orleans County in many years, sang to a capacity crowd at St. Mary’s Catholic Church. Chris Busch: The chairman of the Orleans Renaissance Group isn’t afraid to aim high and reach for the stars. 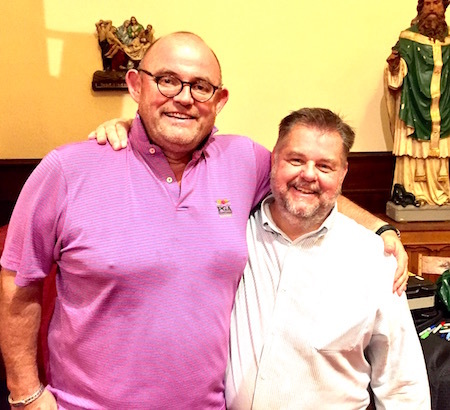 Last year he and the ORG welcomed famed Irish tenor Ronan Tynan to Medina for a concert at St. Mary’s Catholic Church. Busch has been an active Medina community member for many years, leading the Tree Board that has helped Medina plant about 1,000 trees in recent years. Busch is chairman of the Medina Planning Board, insisting on design standards in the historic district that have preserved Main Street’s look as if it was a Norman Rockwell painting. Those standards have attracted investment in the downtown from numerous businesses. Busch last year also helped spearhead the first-time Farm-to-Table Dinner event in Medina on Aug. 4 that attracted 137 people for a fine dining experience on a closed off section of Main Street. Holly Ricci-Canham: The Carlton woman compiled a book on local farmers, a two-year effort that culminated in 300 pages after intviewing 150 farmers. “Mom & Pop Farming in Orleans County, New York – The past brought to life” is one of the most ambitious local history books in many years. The book includes about 400 photographs and includes reminisces about simple days with lots of hard work. The farms featured in the book were part of a close-knit community with neighborhood schools and churches. Ricci-Canham grew up on a “mom and pop” farm in Kenyonville run by her parents, Pete and “Mike” Ricci. The book covers farm operations throughout county with sections about muck farmers, dairies, fruit and vegetable farms, canning companies, migrant labor camps, “ladies accounts,” technology changes as well as country schools, “kids play” and fairs and celebrations. Bill Menz: The Medina resident has spent more than a decade working on a monument and memorial outside the former Medina Armory, which has been a YMCA the past 35 years.Menz doesn’t want the original purpose of the building to be forgotten, as a training site for soldiers who served in many wars. Menz helped build the monument that was unveiled in 2008 by the Armory. In recent years he has been raising money for a bronze statue to go on top of the monument. Menz and the Company F Memorial Committee met its $65,000 goal at the end of 2016, with Menz sending out letters, knocking on doors and making numerous phone calls. The 7-foot-high statue could be ready in 2018. Orleans Hub is pleased to recognize several “Outstanding Citizens” who contribute to making a better community. Many of these residents have been volunteering or serving in community causes for many years. They do their good deeds for little to no pay, driven by a love for their community and neighbors. Nicole has Triple X Syndrome. She hasn’t let that disability prevent her from being a tireless advocate against a disease that took the lives of her grandparents, Don and Jane Bradley. Alzheimer’s disease is devastating, debilitating the mind and body. Nicole sells many of the links from her mother’s cookie shop in Medina. Mary Lou Tuohey owns Case-Nic Cookies. Mary Lou’s father, a former engineer, withered away over 13 years to the point where he couldn’t recognize his four children. Her father died at age 65 from Alzheimer’s. Her mother also fought the disease. Nicole worries her mother, too, may someday face Alzheimer’s. That is why Nicole pushes so hard to raise money for research. Every July for the past 25 years the East Shelby Community Bible Church hosts an “Old Tyme Day” celebration at their church, serving pie, lemonade and hot dogs for a penny. There are horse-drawn rides, candle-making, and other activities with an emphasis on fun – and old-fashioned technology. About 2,000 to 3,000 people attend Old Tyme Day, a huge crowd for the tiny hamlet in East Shelby once known as West Jackson Corners. Church members have created a mini-village across from the church. That village also draws about 500 to 1,000 people for an old-time Christmas celebration. Olsen puts an emphasis on the Gospel message, and providing wholesome and fun activities for the community. 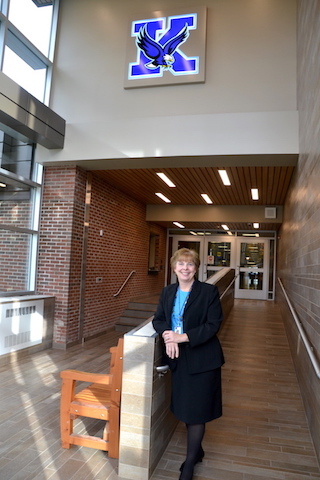 Carol D’Agostino is pictured in the new lobby of the Kendall Junior-Senior High School, following an extensive capital project this year. Carol D’Agostino is principal of her hometown school, the Kendall Junior-Senior High School. She led the school through a major capital project the past two years and is committed to many community organizations, serving on the boards for the Orleans Economic Development Agency, the Orleans County United Way and the Human Services Council of Orleans County. D’Agostino serves on the boards, often looking for ideas to bring back to Kendall to improve opportunities for students and the community. Through the Human Services Council, she met Marc O’Brien, the county’s mental health director. D’Agostino and the school district welcomed a mental health counselor from O’Brien’s staff to have a satellite office at the school district. That way students don’t have to make the trip to the county Mental Health Department building in Albion. D’Agostino said transportation is an issue for many students and their families. Having the satellite site in Kendall also means less time out of classes. D’Agostino is a member of the Lawnchair Ladies. together leaders from the school district, town government and county to brainstorm ways to promote Kendall. D’Agostino said her position on the EDA showed her the municipal cooperation for the Pride Pak project in medina this past year. The county, Village of Medina, Town of Shelby and state all chipped in to bring in needed infrastructure for the new vegetable processing plant. In Kendall, the student enrollment is dropping. But D’Agostino said opening up more building lots with infrastructure could draw more families to the town. “How can we look at opportunities in Kendall to grow Kendall?” she said. D’Agostino is visible at many community events, and also participates in the Kendall Lawnchair Ladies and the Kendall Corcordia Lutheran Church. Her husband Phil is also a member of the Lions Club and chairman of the Kendall Firemen’s Carnival. Linda Redfield is pictured on July 16 during a surprise party for her by many of her students at the World Life Institute in Waterport. 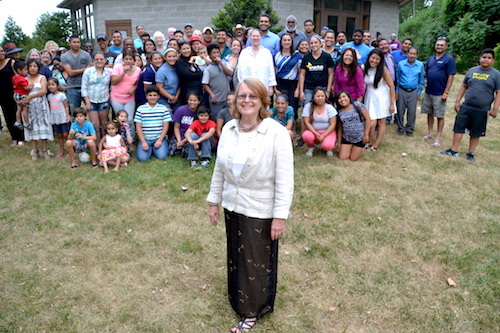 In the past 20-plus years, Linda Redfield has helped about 400 farmworkers learn English. Redfield started going to labor camps in 1994, before a school built by the World Life Institute became the base for classes in 1999. The school on Stillwater Road offers evening courses in English, as well as computer literacy, pottery and other programs. Redfield is the driving force behind the educational program. Her students have improved their English, allowing many to get promotions at work and be more active in the community. Many of her students have earned GEDs. Ten of the students have earned their U.S. citizenship. Redfield is well regarded around the state as an ESL teacher. In 2013, she was honored in Albany as “Teacher of the Year” by the New York State Association of Adult Continuing Education Programs. Five of her students have won “Student of the year” by the association. Jose Iniguez was one of Redfield’s first English as a Second Language students in 1994, when Redfield went to a labor cap on Densmore Road to teach English to farmworkers. Iniguez only spoke Spanish at the time. After a long day of work in the fields, Iniguez would study English. Redfield was always patient, always encouraging, Iniguez said. She was also flexible. Farmworkers might not get to the camp until 8 p.m., and Redfield would be ready to help them learn. Iniguez said learning English helped him to get promoted at the LaMont farm. Today, he is co-owner of Lamont Fruit Farm, a 500-acre farm based down the road from the WLI school. 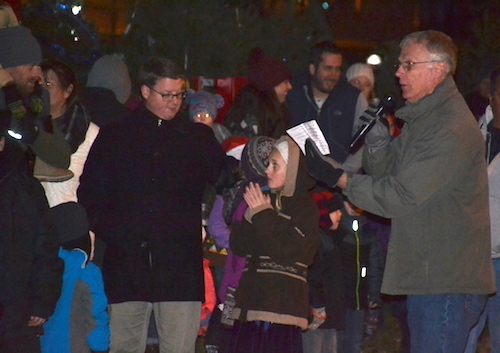 Wes Bradley, right, serves as emcee of Lyndonville’s Christmas celebration on Dec. 3 when Santa arrived and 61 Christmas trees were lighted up at Veterans’ Park. Lyndonville is the place to be on July Fourth with thousands of people flocking to Orleans County tiniest village for one of the biggest fireworks shows in Western New York. Wes Bradley is chairman of the annual fireworks show and he spends all year raising money on the big show, which tops $20,000. He starts raising money for the fireworks on July 5 and is collecting funds on July 4th during the Independence Day festival in Lyndonville. Bradley deserves credit for his diligence with the annual spectacle. He also is popular with Young Explosives, the fireworks company, because he brings the crew water and a chicken barbecue. He also stays with them until 2 or 3 in the morning with the cleanup from the fireworks. Bradley, a retired teacher, is active in the community in many ways, from serving on the Yates Town Board, to 37 years with the Fire Department and serving as finance chairman for the Lyndonville United Methodist Church. He also serves on the Lyndonville Area Foundation Board of Directors, which distributes more than $100,000 a year to community causes. Bradley also helped start Lyndonville’s annual Christmas celebration in 2013, where residents, businesses or organizations decorate Christmas trees in Veterans’ Park. That has now grown to 61 trees with the community welcoming Santa and singing Christmas carols. Bradley said many people help pull off the events in Lyndonville. He said he’s happy to be part of all the projects. “I’m retired and I enjoy being active and helping to make things happen for the community,” he said. Jack Burris is pictured with the Hands 4 Hope vehicle, “Clifford,” which goes out four Saturdays each month. Jack Burris and a team of volunteers debuted “Clifford” on Jan. 30. The former red delivery truck was transformed into a place for prayers. Burris and the new ministry, Hands 4 Hope, also distribute bags of groceries, about $20 worth per person. Burris, owner of a cleaning business, felt a calling to start the ministry, which is modelled after the Care-A-Van ministry in Batavia, which has been operating for 17 years. They give out about 30 “shares” or bags of food. An anonymous donor has covered most of the cost of the food this year. Burris and the Hands 4 Hope team welcome people to share prayer requests, and the group is willing to pray – right in the truck. Burris writes down the requests and keeps the people in his prayers. Burris said the past year has been an eye-opener while also strengthening his faith. He estimates Hands 4 Hope has given out about 1,500 shares of food, many coats and other supplies. 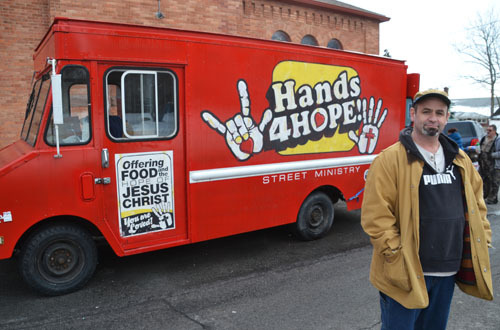 Hands 4 Hope isn’t a mobile food distribution program. Chris Busch isn’t afraid to aim high and reach for the stars. Busch has been an active Medina community member for many years, leading the Tree Board that has helped Medina plant about 1,000 trees in recent years. Busch is chairman of the Medina Planning Board, insisting on design standards in the historic district that have preserved Main Street’s look as if it was a Norman Rockwell painting. Those standards have attracted investment in the downtown from numerous businesses. The Renaissance Group on Sept. 17 welcomed famed Irish tenor Ronan Tynan for a capacity concert of 650 people at St. Mary’s Catholic Church. Busch was the point man for Tynan, ensuring the sound and accommodations met Tynan’s standards. Tynan’s powerful voice filled the church, and he had the audience laughing with some of his stories. Busch, who works full time as a teacher in Lockport, is an enthusiastic booster of the Medina community. He recently designed the interpretive panels in Medina’s downtown and also pushed for a historical marker in honor of Frederick Douglass’s speeches in Medina in the mid-1800s. Busch also helped spearhead the first-time Farm-to-Table Dinner event in Medina on Aug. 4 that attracted 137 people for a fine dining experience on a closed off section of Main Street. These types of dinners are more typical in trendy urban areas, but Medina proved an ideal setting with a vibrant downtown with well-maintained buildings. Holly Ricci-Canham holds a copy of “Mom & Pop Farming in Orleans County, New York – The past brought to life.” She worked two years on the 300-page book, interviewing 150 farmers. Holly Ricci-Canham worked two years on one of the most ambitious local history books in many years. 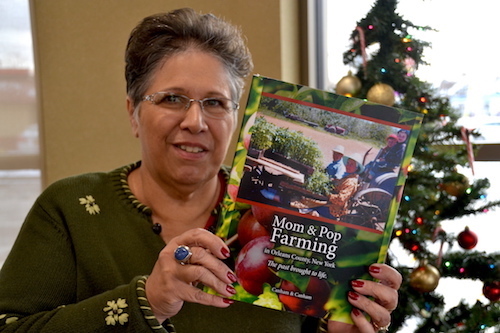 Ricci-Canham interviewed 150 farmers for a 300-page book about “mom and pop” farms. The book includes about 400 photographs and includes reminisces about simple days with lots of hard work. The farms were part of a close-knit community with neighborhood schools and churches. Ricci-Canham grew up on a “mom and pop” farm in Kenyonville run by her parents, Pete and “Mike” Ricci. They would relocate the fruit and vegetable farm to West Avenue in Albion. Her upbringing on the farm made her want to tell the stories of local farms. “You see the gigantic farming tractors now, which is so different from the farming I grew up with,” she said earlier this month when the book came out. The book covers farm operations throughout county with sections about muck farmers, dairies, fruit and vegetable farms, canning companies, migrant labor camps, “ladies accounts,” technology changes as well as country schools, “kids play” and fairs and celebrations. Bill Lattin, the retired Orleans County historian, wrote the forward of the book, and praised Ricci-Canham for an “invaluable” book of local history. “These are first-hand accounts relating to a lifestyle which has all but vanished,” Lattin wrote. 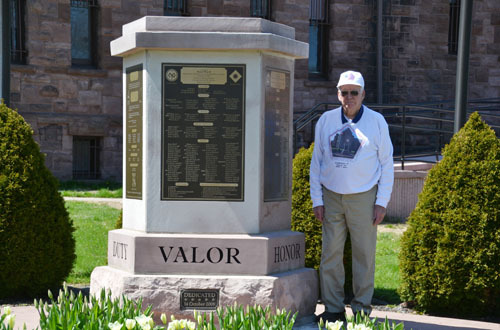 Bill Menz has been instrumental in the monument to the soldiers who trained at the former Medina Armory. Menz also led a fund-raising effort for a bronze statue of a solider to go on top of the monument’s base. Bill Menz has been determined the past decade to have a fitting tribute for the Company F men who trained at the Medina Armory. Menz was instrumental in getting a monument erected in 2008. That stone monument base includes the names of 550 local soldiers who fought in wars on behalf of the United States. The soldiers enlisted and trained at the Medina Armory for conflicts from 1898 to 1945 including the Spanish-American War, Mexican-American, World War I and World War II. When the monument was dedicated on Oct. 14, 2008, some of the widows and family members of World War II soldiers and other veterans in Company F attended and expressed their appreciation. Menz didn’t feel the monument was complete. He wanted a bronze statue on top of the base, a statue resembling a young soldier, someone who looks between 18 and 21. That was typical of Company F.
For the past few years Menz has been leading the fund-raising efforts for a 7-foot-high statue. The Company F Memorial Committee met its $65,000 goal this year, with Menz sending out letters, knocking on doors and making numerous phone calls. There were numerous donations with $10,000 from the VFW in Medina the largest. The committee is working with artist Brian Porter. Menz is hopeful the statue could be in place in the next year to 18 months. It will be the first bronze statue in Orleans County. The Outstanding Citizens will be recognized at a reception in early 2017. The front row, includes, from left: Joette McHugh, Randy Bower, Gail Miller and Melissa Ierlan. Back row: James DeFilipps, Marietta Schuth from Kendall Community Choir, Tony Hipes from Medina Area Association of Churches, Sue Metzo from MAAC, Lisa Stratton, and Thom Jennings (accepting on behalf of his nephew Peter Zeliff Jr.) Missing from photo includes Al Capurso and Bob Songin. Bower was recognized as Person of the Year after being elected sheriff in one of the most competitive county elections in recent memory. The Outstanding Citizens were named by the Orleans Hub on Dec. 31. Editor Tom Rivers and Publisher Karen Sawicz weighed the contributions from people and organizations in 2015. The Kendall Community Chorus has performed in numerous concerts since 2008. The group has been led by director Mary Campbell. Sixty-eight people have sung in the choir since it started, and many have become close friends through the group. Joette McHugh has been an active volunteer with the Friends of the Orleans County Animal Shelter the past seven years, helping to adopt out 1,500 animals from the shelter. She knows all of the dogs and cats by name, and has an energetic group of volunteers looking after the animals. The Friends also raised $7,000 for the animal shelter last year, and those funds helped to have all dogs neutered at the shelter, and also paid for a new washer and dryer. Medina Area Association of Churches has been together for nearly 50 years, running a Clothing Depot throughout the year, an annual holiday toy and food drive for about 150 children in the community, and a working together on other religious and community events. The depot generates about $30,000 to $35,000 annually that the churches give back to the community for many causes. Bob Songin, a charter boat captain, lead a pen-rearing project from 1998 to 2014 until passing off the reins to a new group of volunteers last year. The pen-rearing volunteers helped to raise fish in the Oak Orchard River. Songin has given countless hours to improve the fishery through the pen-rearing project, where about 100,000 baby fish are nurtured each year in the Oak Orchard. The project has increased the survival rate of fish, and charter boat captains say more bigger fish return to the Oak Orchard for fall fishing runs since the pen-rearing, boosting the county’s top tourism industry. Lisa Stratton, owner of the Hazy Jade Gift Shop in Albion, also spearheads several efforts in Albion, including the planting and watering of downtown flowers, and organizing the annual wine-tasting, Beggar’s Night the Friday before Halloween, and other projects to promote downtown businesses and the community. Peter Zeliff Jr. turned an old farmhouse in West Shelby turned into hunting retreat for wounded warriors. Zeliff and a team of volunteers fixed up the house and connected with veterans’ groups to bring injured soldiers to the site for a few days of hunting. The property has been renamed The Warrior House. The site hosted its first hunt in September with 13 wounded veterans. Other groups have followed and The Warrior House will be made available to spouses and children of veterans as well. Gail Miller stepped forward last year as volunteer coordinator of the new Canal Village Farmers’ Market in Medina in the parking lot across from the Post Office. Miller worked with vendors and lined up entertainment and exhibitors. Some Saturdays, 450 to 500 attended the market. Al Capurso led a volunteer effort to save a cobblestone schoolhouse from 1832, a former one-room schoolhouse on Gaines Basin Road, just north of the Erie Canal. The schoolhouse was built in 1832 and is one of the oldest cobblestone buildings in the area. The building has been largely abandoned since 1944, until last year when it got a new roof. Boards were removed from windows and sashes restored. Junk was cleared out, and a historical marker put up. Melissa Ierlan has given many faded historical markers a fresh coat of paint. She started that effort in 2014 when Clarendon was celebrating the 150th anniversary of Carl Akeley’s birth. Akeley grew up in Clarendon on Hinds Road and became one of the most famous taxidermists in the world. The historical marker on Hinds Road about Akeley could barely be read due to flaking paint. Ierlan took the marker down, stripped off the remaining paint and repainted it blue and gold. She has now worked on about a dozen markers around the county. James DeFilipps was shot twice in a shootout at 3 a.m. on March 21 following a high-speed chase with James Ellis of Wyoming County. DeFilipps was the first police officer on scene when Ellis wrecked his vehicle in Clarendon on Route 31A. Police were pursuing Ellis after a 911 call when he threatened an ex-girlfriend in Shelby with a gun. Ellis had fled to a nearby wooded area in Clarendon and opened fire on DeFilipps and other deputies and police to arrive on the scene. DeFilipps, despite getting hit twice by gunfire, shot Ellis, killing him and ending his threat. For his acts of valor, DeFilipps was named Deputy of the Year for 2015 by the New York State Sheriff’s Association. Orleans County is blessed to have many dedicated volunteers and generous residents, who give of their time, talents and financial resources for a better community. Each year since the Orleans Hub started in April 2013 we’ve recognized outstanding citizens and we want to do it again. 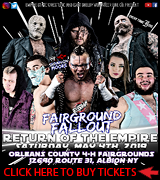 This time there are two – Melissa Ierlan of Clarendon and Al Capurso of Gaines – who are first-time “repeat winners.” We have no limits on how many times someone can be recognized. Many residents make big contributions to the community, year after year. Photo by Kristina Gabalski – Mary Campbell, far right, directs the Kendall Community Choir during a holiday concert in November. 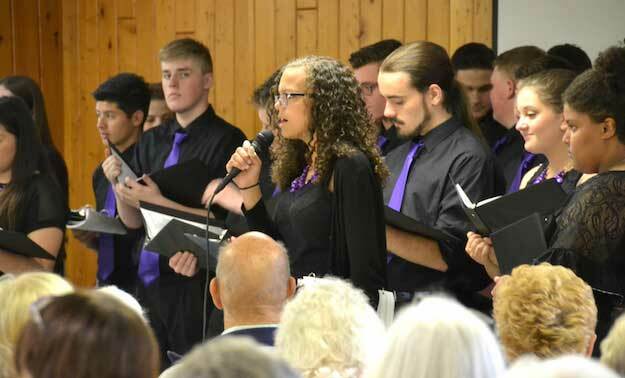 The concert also served as a benefit for the Kendall Food Cupboard. In 2008, Mary Campbell put notices in Kendall churches and public buildings, looking for singers. Campbell retired as a Kendall music teacher in 2007. A year later, she was eager to lead voices again. Campbell hoped 20 people from Kendall would volunteer for the Kendall Community Chorus. The first practice, 50 people showed up. The choir has performed in numerous concerts since then, including a big bash for Kendall’s bicentennial in 2012. They have sung in the school, at the town park, and many local nursing homes. They begin the annual Kendall Fireman’s Carnival Parade with the “Star Spangled Banner” and “America, the Beautiful.” They even sang a patriotic medley in a flash mob at Wegmans in Brockport. 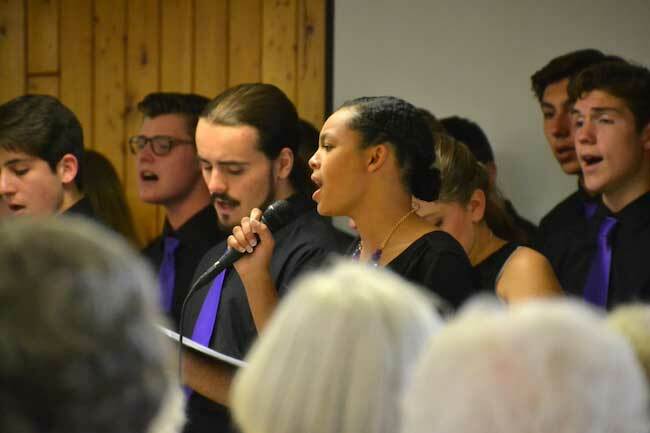 The group’s annual November concert benefitted the Kendall Food Cupboard, with people urged to bring canned goods or cash donations. “We tried to go where there were people we knew,” Campbell said. Sixty-eight people have sung in the choir since it started. Many have become close friends through the group. Campbell announced after the November concert she was retiring from directing. She thanked the many dedicated singers. About 30 have stayed with the group since it started. Campbell has been the group’s leader as it enriched the community, and built strong bonds of friendship. She said the singers have all given of their time to make the group a success. Eighteen members of the Kendall Community Chorus sang in October 2014 at the Middleport Community Choir Invitational. The 18 members from the Kendall Community Chorus are, from left, first row: Kristy Markham, Alissa Grimm, Lisa Rowley, Katie Presutti, Marilynn Kundratta and Mary Campbell. Second row: Cindy Curtis, Debbie Collichio, Eileen Young and Candy Mael. Third row: Carol Duerr, Marietta Schuth and Mary Lou Lockhart. Fourth row: Jeremy Rath, Nancy Grah, Christopher Tobin, Robert Bissell and Eileen Grah. Photo by Tom Rivers – Joette McHugh of Albion, center, is pictured with her husband Bill and Gina Smith of Hilton. They are with Zurie, a Shar-Pei/Lab mix. About 20 volunteers are regulars at the Orleans County Animal Shelter, feeding animals, taking dogs for walks, socializing cats and performing other duties. Ever since she retired nine years ago, Joette McHugh has been a devoted volunteer at the Orleans County Animal Shelter. She knows all of the dogs and cats by name, and has been instrumental in adopting out many of the animals. She also has been a driven fund-raiser and spearheaded the start of the Friends of the Orleans County Animal Shelter. She is president of that group, which had a fund-raising gala at The Pillars in May, bringing in about $7,000. That has helped to have all dogs neutered at the shelter, and also paid for a new washer and dryer. Most of the animals at the shelter are chipped which makes it much easier to find their owners if the animals are ever lost or on the loose. The number of adoptions has actually gone down in the past couple years because the shelter has been able to find many of the owners. However, many cats and dogs don’t have homes. McHugh, the other dedicated volunteers and Animal Control Officer Kathy Smith have adopted out 1,500 dogs and cats in the past seven years. McHugh brings enthusiasm and joy to the shelter, whether its feeding the animals, walking dogs, playing with cats or cleaning cages. “I love the animals and thought if there was anything I could do to help I would,” McHugh said. Some of the members of the Medina Area Association of Churches are pictured on Dec. 19 after toys. clothes and food were delivered to Medina families, including about 150 children. The group includes, from left: Grace Pries from the First Baptist Church, Rosey Boyle from the United Methodist, Donna Johnson from the Presbyterian Church, Sue Metzo from the Presbyterian, Pastor Tony Hipes of the United Methodist, Joanne Arnett with United Methodist, and Ronnie Barhite from St. John’s Episcopal Church. For more than four decades a group of Medina churches have played Santa during the holidays for local families. The annual MAAC toy drive allows about 150 children to have several toys each year, as well as food, and new hats, mittens, scarves and socks. The churches also work together throughout the year running the clothing depot at the Calvary Tabernacle Assembly of God, the former Medina High School. The depot sells clothes below thrift store prices. 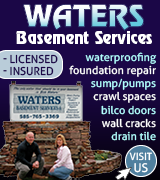 It generates about $30,000 to $35,000 annually that the churches give back to the community for many causes. The humanitarian work has brought Christians from several churches together, strengthening their fellowship while they provide for local residents. MAAC members Sue Metzo (left) and Sylvia Riviere are pictured in December 2014 inside the Medina United Methodist Church at the former Apple Grove Inn, which has become the headquarters for the annual present sorting. Bob Songin, in red, lead the pen-rearing project from 1998 to 2014 until passing off the reins to a new group of volunteers this year. Songin remains active in helping to raise the fish in the Oak Orchard River. 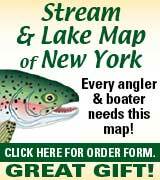 Orleans County’s top tourism draw are big salmon and trout in Lake Ontario and local tributaries, such as Oak Orchard River, Johnson Creek and Sandy Creek. Fishing has a $12 million economic impact in the county each year. A local charter boat captain has given countless hours to improve the fishery through a pen-rearing project. With that effort, begun in 1998, about 100,000 baby fish are delivered to pens in the Oak Orchard River from the Altmar Hatchery. The fish arrive at about 2 inches long. The are babied and nurtured for a month in the Oak Orchard, doubling in size before they are released from the pens. They are fed five times a day, beginning at 5 a.m. The month in the Oak Orchard allows the fish to imprint on the river, increasing the chances they will return to spawn when they are mature. Without the pen-rearing, the fish would more likely head near Oswego and the Salmon River, near the Altmar Hatchery. Bob Songin is charter boat captain with Reel Excitement. Songin and the volunteers have increased the survival rate of fish, and charter boat captains say more bigger fish return to the Oak Orchard for fall fishing runs since the pen-rearing. Songin also has shared the success of the Oak Orchard pen-rearing with other fishing communities. Now there are similar efforts in Olcott and the Genesee River in Rochester. This year he handed off the main pen-rearing responsibilities to Mike Lavender, Bob Stevens, James Cond, Chris Efing and Ian Scroger. Lisa Stratton is dressed in costume during Beggar’s Night in October, when hundreds of children stopped by Albion businesses for treats. Lisa Stratton, owner of the Hazy Jade Gift Shop in downtown Albion, remains one of Albion’s biggest boosters and tireless workers. Each spring she and a few other volunteers fill concrete planters with dirt and flowers. She also arranges for the hanging baskets on Main Street. Stratton organizes volunteers to water the flowers on weekends. She also helps plan many of the events through the Albion Merchants Association, including a wine tasting, Beggar’s Night with candy for children, and other activities throughout the year that provide fun for the community while promoting the locally owned businesses in the downtown. She attends many of the Village Board meetings, advocating for the downtown businesses, and often will step forward to help with a community event. Photos by Thom Jennings – Hunters pose with some of the birds harvested during a hunt in September in Shelby, the first for The Warrior House. Peter Zeliff Jr. turned an old farmhouse in West Shelby into a therapeutic site this year for wounded veterans. Zeliff and a team of volunteers fixed up the house and connected with veterans’ groups to bring injured soldiers to the site for a few days of hunting. The property was renamed The Warrior House. The site hosted its first hunt in September with 13 wounded veterans. Other groups have followed and The Warrior House will be made available to spouses and children of veterans as well. Zeliff sees the site as a ministry for people who served the country. Some bear obvious injuries and walk with a cane. Others suffer from Post Traumatic Stress Disorder and constant physical pain. Shannon Girard from Lafayette, La. was out for a hunt at The Warrior House in late October-early November. Girard, 40, said he “slept like a baby” over the weekend on his hunting retreat. That is a big deal for Girard and the other veterans. Girard was deployed as a medic to Iraq in 2004-05. The Louisiana resident said the hunting getaway is a perfect way for veterans to calm their nerves and bodies, while connecting with others in the military. Zeliff, through his generosity and hard work at The Warrior House, is making a big difference for many soldiers. Peter Zeliff Jr. is pictured in July during a workday at The Warrior House. Photo by Tom Rivers – Gail Miller stepped forward this year as volunteer coordinator of the new Canal Village Farmers’ Market in Medina. A farmers’ market that operated in the Canal Basin for about a decade ceased after the 2014 season. The Orleans Renaissance Group saw a farmers’ market as a draw for the downtown and residents’ quality of life. The ORG decided to start a new market, The Canal Village Farmers’ Market. The market date was moved from Thursdays to Saturdays, and the location shifted from the Canal Basin to the parkign lot across from the Post Office. 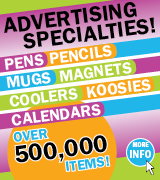 Gail Miller volunteered to lead the market, working with vendors and lining up entertainment and exhibitors. Some Saturdays, 450 to 500 attended the market. “It’s been a great group effort,” said Mrs. Miller on the market’s final day of the season, which was Halloween. She dressed as an Angry Bird character that day. Next year the market will start in June, and Miller said there will be more entertainment and demonstrations. She has been a key to the market’s success and it’s bright future. Al Capurso is pictured with a new historical marker that was unveiled Oct. 17 by a former one-room schoolhouse on Gaines Basin Road, just north of the Erie Canal. The schoolhouse was built in 1832 and is one of the oldest cobbesltone buildings in the area. Orleans County is home to about 100 cobblestone buildings and many other historic sites that are a source of pride. But there could be more if the wrecking ball, fires and neglect hadn’t destroyed former mansions, schoolhouses and other sites established in the 1800s. Al Capurso didn’t want to lose another building that is important to the county’s past. This year Capurso rallied volunteers to save a former one-room schoolhouse on Gaines Basin Road. The building from 1832 is one of the oldest cobblestone buildings in the county and region. The building has been largely abandoned since 1944. This year it got a new roof. Boards were removed from windows and sashes restored. Junk was cleared out. Capurso and members of the Orleans County Historical Association also put up a historical marker for the school. The marker notes that Caroline Phipps taught at the school. She went on to be a distinguished educator and ran the Phipps Union Seminary in Albion from 1837 to 1875. That spot later became the County Clerks Building. The 913-square-foot building needs more work and Capurso has a game plan to get it done. Next year he said there will be repairs to the floor, and the building will be rewired and ceiling and walls plastered. Some missing sections of cobblestones will be replaced with appropriate soft lime mortar. In 2017, Capurso said he expects the site will receive donations for a piano, school desks, teachers desk, wood stove, tables, chairs and wall hangings. The site, where hundreds of children were educated, will add to the county’s historical fabric. A treasure that could have caved in has been saved. Capurso was recognized as an outstanding citizen by the Orleans Hub in 2014 for leading the effort to have the federal government name a creek in honor of a pioneer resident, Elizabeth Gilbert. It flows 6.5 miles along Brown Road in Gaines across Ridge Road to Carlton. It took a year of lining up local support, and gaining permission from the federal Bureau of Geographic Names. 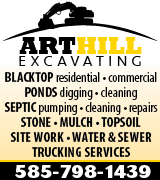 The agency on April 10, 2014 formally approved the naming request. In August, the historical marker for Balcom’s Mills on Fancher Road in Murray was reinstalled with fresh paint. Melissa Ierlan, the Clarendon town historian, repainted the marker. She is right of the marker in light purple shirt. Ierlan repainted nine historical markers in the past two years. It started in 2014 when Clarendon was celebrating the 150th anniversary of Carl Akeley’s birth. Akeley grew up in Clarendon on Hinds Road and became one of the most famous taxidermists in the world. Melissa Ierlan, the town historian, noticed the historical marker on Hinds Road about Akeley could barely be read due to flaking paint. She took the marker down, stripped off the remaining paint and repainted it blue and gold. She did three others in Clarendon. It’s tedious work, but she wanted the markers to look good. Other communities also had markers in need of fresh paint and Ierlan this year has redone five markers, including one for the Elba Muck, one in Albion for Grace Bidell, two on Ridge Road in Gaines, and one in Murray. She has three others and some will require welding. The restored markers not only make it easier to read about prominent people and places in the community’s past but also project a message that the community cares about its historical assets. Ierlan has done a nice service in reviving some of these markers. She was also an outstanding citizen in 2014 for her efforts to save the chapel at Hillside Cemetery. 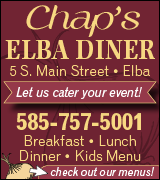 Ierlan received good news on that project on Dec. 10 when the state announced a $126,210 grant for the chapel. Deputy James DeFilipps is pictured with his wife Marie and their infant son Jake at the Orleans County Public Safety Building on May 19 during a recognition program. It was 3 a.m. on March 21 when James DeFilipps was shot twice following a high-speed chase with James Ellis of Wyoming County. Thankfully, the deputy was wearing a bullet-proof vest. DeFilipps was the first police officer on scene when Ellis wrecked his vehicle in Clarendon on Route 31A. Police were pursuing Ellis after a 911 call when he threatened an ex-girlfriend in Shelby with a gun. DeFilipps was the first on the scene. Ellis had fled to a nearby wooded area and opened fire on DeFilipps and other deputies and police to arrive on the scene. DeFilipps, despite getting hit twice by gunfire, shot Ellis, killing him and ending his threat. Police feared Ellis could have shot more officers on the scene if DeFilipps hadn’t been there. Ellis could have fled to a neighbor’s house. A grand jury reviewed the evidence and found DeFilipps was justified in the shooting. After recovering from his wound to his stomach, he returned to the night shift for the Orleans County Sheriff’s Department, where he has worked nearly 13 years. 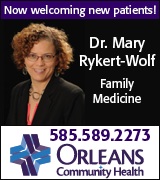 Orleans Hub will recognize the outstanding citizens during a reception in February. We announced these award winners in late December and wanted to have a reception to recognize them. About 60 people braved the bad weather for the reception. Orleans Hub picked volunteer firefighters as the “Person of the Year” for their endless commitment to the community, helping in times of need. The following are pictured, front row, from left: Peter Hendrickson, fire chief for Holley Fire Department; Jim Tabor, president of Carlton Volunteer Fire Company; Valerie Childs, a director with the Ridgeway Volunteer Fire Company; and Adam Ehrenreich, captain with the Lyndonville Fire Department. Back row: Clarendon Fire Chief Jon DeYoung; Howard Watts, assistant fire chief with Shelby Volunteer Fire Company; Devin Taylor, captain with East Shelby Volunteer Fire Company; Gary Sicurella, president of Fancher-Hulberton-Murray Fire Company; Mike Schultz, Kendall fire chief; Jeremy Graham, assistant chief for Albion Fire Department; and Jonathan Higgins, captain with the Medina Fire Department. Jerry Bentley, fire chief for Barre, planned on attending but needed to work plowing roads. For more on the 2014 Person of the Year, click here. The Hub also presented certificates to the Outstanding Citizens of 2014. The group includes, front row, from left: Melissa Ierlan of Clarendon, president of the Clarendon Historical Society; State Assemblyman Steve Hawley; Jim Hancock, Parade of Lights organizer in Medina. Back row: Erik and Marlene Seielstad, leaders of the 4-H robotics and Legos program; Kim Corcoran, leader of the Kendall Lawn Chair Ladies; Al Capurso, pioneer enthusiast; and Bilal Huzair, leader of a food dispersal program in Medina. For more on the Outstanding Citizens and why they were selected, click here. Several residents deserve to be recognized as “Outstanding Citizens” for their efforts to make Orleans County a better place this past year. They did many good deeds for little to no pay, driven by a love for their community and neighbors. Photos by Tom Rivers – Kim Corcoran leads the Lawn Chair Ladies at a local parade. When the Town of Kendall celebrated its 200th birthday in 2012, Kim Corcoran and some of her friends decided to add some excitement to the local parade. Corcoran and her friends formed the Lawn Chair Ladies and had a dance routine on the parade route. 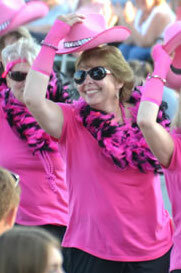 The women, while wearing pink boas, choreographed a number with lawn chairs. 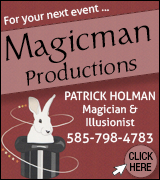 They were an immediate sensation and now perform at many community events during the year. The group has 18 members who practice regularly. Corcoran grew up in Kendall and was in the marching band. After a 35-year career in New York City in the advertising and publishing business, Corcoran moved back to her hometown in June 2011. She attended the parade at the Kendall Firemen’s Carnival and thought it was missing some excitement that June. The Lawn Chair Ladies formed to add some pep to the local parade and haven’t skipped a beat since, performing in Kendall, Holley and Brockport, with requests for other events. Corcoran also has been appointed the town historian. A giant snowman makes its way down Main Street in a lighted float by MAK Plowing and Landscape in Medina on Nov. 29. Jim Hancock coordinates the parade that includes many businesses, civic groups and other organizations. Since he retired as director of the Job Development Agency in Orleans County, Jim Hancock has been busy working for free for the Medina community. He heads the Medina Tourism Committee and makes sure a visitor center inside Medina City Hall is staffed during the summer. He plans an annual concert by the Canal Basin, and has been instrumental in establishing the Medina Sandstone hall of Fame inside City Hall. Hancock visits all of the nominated sites, which stretch throughout New York State and to Erie, Pa.
Jim Hancock, a member of the Medina Sandstone Hall of Fame committee, discusses the Million-Dollar Staircase in Albany, which was partially built with Medina Sandstone. The Staircase has been nominated for the Medina Sandstone Hall of Fame. Hancock spearheads one of Medina’s most popular events: the annual Parade of Lights on the Saturday after Thanksgiving. It has turned into a mega-draw for Medina, filling the downtown and some side streets with thousands of people. The number of glowing floats increases each year. It is a great display of community pride. Al Capurso is pictured on a pedestrian bridge over Gilbert Creek in the Town of Gaines. For about two centuries Orleans County residents passed by a creek in Gaines and Carlton. The unnamed waterway has remained largely unspoiled and undisturbed. Al Capurso wanted it to have a name and to honor a pioneer resident who lived next to the creek more than 200 years ago. For more than a year he researched the 6.5-mile creek that starts near Brown Road and heads northeast to Marsh Creek in Carlton. Capurso pushed for the waterway to honor Elizabeth Gilbert, the first settler on Ridge Road in Orleans County. Gilbert and her husband built their cabin in 1807. Mr. Gilbert died soon after they settled, and his wife was left to raise a family and make a life in the wilderness of the Niagara frontier. It took Capurso a year of lining up local support, and gaining permission from the federal Bureau of Geographic Names. The agency on April 10 formally approved the naming request. Capurso painted a wooden sign with the name, “Gilbert Creek.” It stands by Ridge Road, next to the Gaines Carlton Community Church. 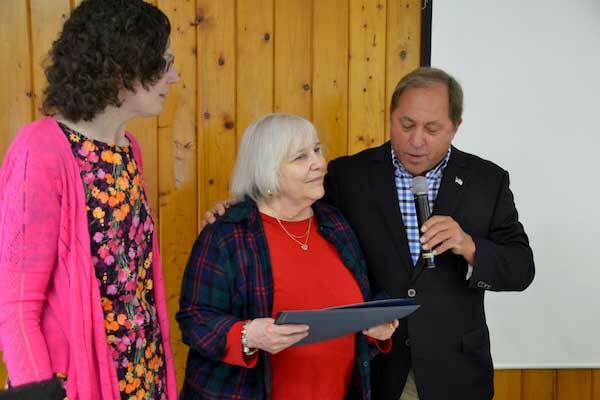 During the May 24 dedication program, State Sen. George Maziarz praised Capurso for working through the bureaucracy to get the creek named for one of the county’s pioneers. “There is no better title than a citizen who loves his community, who respects his community,” Maziarz said about Capurso. Al Capurso’s son Dan unveils the sign for Gilbert Creek by Ridge Road during a dedication program on May 24. Bilal Huzair stacks up some frozen pizzas on Dec. 20 during a Foodlink delivery in Medina next to the Old Mill Run Restaurant on Route 63. About two years ago Bilal Huzair and his family opened the Old Mill Run Restaurant on Route 63, just south of Maple Ridge Road. Huzair met many local residents and had a sense that many were struggling to buy groceries. Huzair and other members of the World Life Institute connected with Foodlink about doing a food drop-off in Medina the first and third Saturdays each month. Huzair didn’t know what to expect – just how many people would show up for fruits, vegetables and other food. The program started in November 2013 and quickly drew big crowds with about 200 people standing in line, with many there two hours ahead of time. Another 200-plus are given food, with deliveries by friends and World Life Institute volunteers. Many of the people in line are senior citizens on fixed incomes. They see their income consumed by medical bills, prescriptions and other bills. An anonymous donor has been paying Foodlink for the food that is given out. Huzair manages the volunteers and keeps the program running smoothly. “These are people who genuinely need things,” he said. Provided photo – State Assemblyman Steve Hawley, lower right, is pictured on Sept. 19 with a group of veterans in Washington D.C. on seventh annual Patriot Trip. About 100 people travelled to the nation’s capitol with Hawley to tour war memorials. Many politicians say they value veterans, but Steve Hawley may be the only elected official in the country who leads about 100 people each year to Washington, D.C. Veterans from World War II, the Korean War and the Vietnam War can tour the war memorials. It is a meaningful trip for veterans and their families and Hawley and his staff deserve praise for all of the effort. Hawley has coordinated the Patriot Trip for seven years with about 750 people travelling to the nation’s capital. “The Patriot Trip is a token of my appreciation for the men and women who have served our country with courage and honor,” Hawley said in September, when the group headed to DC. Hawley isn’t an Orleans County resident. He is from Batavia. He has kept his district office in Albion, even when redistricting shifted the district south with more of Genesee County. 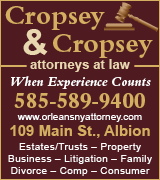 He has shown his commitment to Orleans County residents. Melissa Ierlan, the Clarendon town historian and president of the Historical Society, unveils a historical marker on Sept. 21 for Hillside Cemetery, which last year was named to National Register of Historic Places. In recent years, Melissa Ierlan has helped save the Old Stone Store in Clarendon, erect historical markers, and get sites listed on the National Register of Historic Places. Ierlan has also been good about forming partnerships and connecting with residents and preservationists. She scored a big win in 2014 by celebrating the life and legacy of Clarendon’s native son, Carl Akeley. Last spring the Clarendon Historical Society was brainstorming programs for the upcoming year. The group considered famous people from Clarendon’s past to feature. Someone mentioned Akeley, one of the most acclaimed taxidermists in the world. Provided photo – Carl Akeley is pictured with a leopard in Africa that he killed with his bare hands after it attacked him. Prominent taxidermists also joined 150 people at the May 21 bash for Akeley. The celebration would link Ierlan, the Historical Society president, with prominent taxidermists who have long wanted to honor Akeley. The taxidermists gave Ierlan several Akeley mementos, including a gorilla death mask, to display at the Town Hall. The taxidermists also started raising $8,000 for a monument to be set in Hillside Cemetery in Clarendon in honor of Akeley. Akeley was also a prolific inventor and world traveller. He died of a fever in the Democratic Republic of Congo in 1926, and is buried there. Ierlan has travelled to New York City with other Historical Society members to see The Akeley Hall of African Mammals, which showcases large mammals of Africa that Akeley killed and stuffed. She and members of the Cobblestone Society Museum are working with a taxidermist to restore a stuffed fox done by Akeley as a teen. 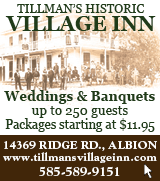 The Historical Society also is working on Akeley’s 151st birthday party in 2015. 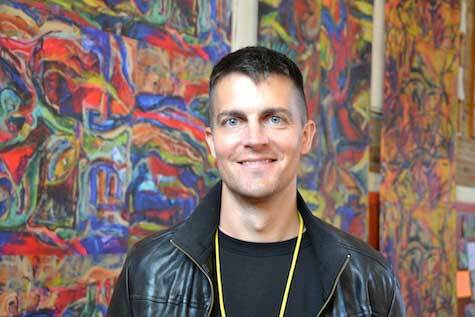 Erik Seielstad has volunteered as mentor in the Lego program since it started in 2012. He is pictured with Dan Squire, 13, of Medina in this photo from early November. Four years ago Erik and Marlene Seielstad pushed to start a robotics program through 4-H in Orleans County. High schoolers program a robot to perform tasks, including picking up and shooting a basketball. “Joe’s Average Slackers” were born, and they have competed in regional events. The Seielstads serve as mentors and their son Morgan is a senior in the program this year. Many parents pushed the Seielstads to start a Lego team for kids in elementary and middle school, and the Seielstads three years ago agreed to coach the team. The The First Lego League proved popular and expanded to three teams last year and a fourth team this year. There are about 40 kids under the guidance of the Seielstads with some help from parents. Marlene Seielstad, right, talks with members of the Prehistoric Robots team during a competition at Churchville-Chili on Nov. 15. The Seielstads have been honored for their volunteer efforts by the FLL regional leaders. Most teams are led by paid staff in school districts. 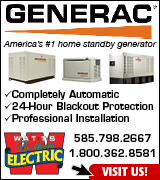 Mr. Seielstad works as a systems engineer in Rochester. He said the students are all learning math and science skills, as well as teamwork. “The kids get the opportunity to work together and accomplish things,” Seielstad said during a November practice. His wife is a member of the Albion Board of Education. She keeps the teams organized and funded. She has numerous businesses backing the robotics and Lego teams. The Seielstads believed the program could work in rural Orleans County. They have been the drivers of its success. 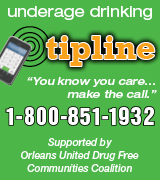 Orleans Hub plans to honor the “Outstanding Citizens” during a reception in early 2015. They performed many good deeds, often when not asked and at no gain to themselves. 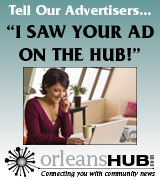 Orleans Hub would like to recognize some outstanding citizens from 2013. Before he robbed the Bank of America in Albion, Jeremy Rothmund of Rochester twice got away with similar crimes in the town of Greece. His girlfriend had a getaway car near the banks and Rothmund escaped. But Rothmund didn’t get away on July 2 when he robbed a bank in Albion. An Albion businessman pulled up to the drive-through at about 4 p.m. that day, ready to deposit a check at the Bank of America. He looked inside the bank window and saw a man wearing sunglasses with a hat on, and an ace bandage wrapped around his chin and neck. The teller indicated to the drive-through customer that the bank was being robbed. The businessman, who has requested anonymity, backed off. “I’m not an Arnold Schwarzenegger, and I could tell he was under the influence of something,” the merchant told the Orleans Hub on July 3. Although he backed off, the businessman knew the robber was likely fleeing to a getaway car. So the merchant followed the robber behind the bank and along the railroad tracks. He watched the robber tear off his mask and get into a blue Ford Focus. The merchant then relayed that description to police. Ten minutes later Holley police stopped the car at Woodside Court, an apartment complex off Route 31 on the west side of the village. Rothmund and his girlfriend Elyse A. Hoffer, 22 have both pleaded guilty. Rothmund faces up to 15 years in state prison. Photos by Tom Rivers – Roger LaMont is chairman of the New York Apple Growers LLC, a group of farmers that worked with Cornell to grow and market new apple varieties. Apples are big business in Orleans County. We’re New York’s second-leading apple county behind only Wayne County. The future of the industry is brighter, and a local grower played a key role in two new apple varieties reaching the market this year. In August, Cornell University and the New York Apple Association unveiled SnapDragon and RubyFrost. Roger LaMont, an Albion apple grower, served as chairman of a group that formed to grow and market the apples. The new varieties are exclusive to New York growers. They won’t be released to growers in other states, which will give growers in the Empire State an edge. That should lead to bigger returns for the farmers, making their farms stronger financially. LaMont is nearing retirement. He took the lead on the initiative, wanting to set up the industry for a more viable future. That should make these farms key contributors to the county’s economy for years to come. Jenn Suhr competes in a pole vaulting competition May 31 at the White Birch Golf Course in Lyndonville. Jenn Suhr, the Gold Medal-winning pole vaulter, is married to Lyndonville native Rick Suhr, who is also her coach. The couple has a home in Kendall. Mrs. Suhr is thankful for the support of her fans in Western New York, but she said many of them have never seen pole vaulting live. When Suhr was prepping for the world championships in August (where she won the silver medal), she helped orchestrate three sanctioned vaulting competitions in Lyndonville, using the White Birch Golf Course for the meets. Her brother-in-law Harold Suhr owns the course. He used the second fairway as a runway for three vault competitions between May 31 and July 4. Suhr cleared the top outdoor height in the world when she went over 16 feet, 1 inch at the White Birch, giving the course a distinction normally reserved for major sporting arenas in the world. “We wanted to bring the pole vault out here so people don’t have to travel and spend tons of money to see it,” Suhr said. The old Stone Store building, currently an eyesore at the corner of routes 31A and 237 in Clarendon, is being turned into an attractive asset for the town. The old Stone Store, once a key focal point to community life in Clarendon, had fallen into disrepair and was considered an eyesore. Many residents two years ago were calling for the building to be torn down. But one local resident convinced the Town Board to call off the wrecking ball. Erin Anheier, chairwoman of the Old Stone Store Preservation Committee, mobilized volunteers to clean up the property and find a buyer for the site, which dates back to 1836. She helped get the site on the National Register of Historic Places. She also helped get Hillside Cemetery in Holley on that list this past year, designations that bring prestige and the prospect of grants for building improvements. Joe and Sue Fertitta are rehabbing the Stone Store. They are gutting and renovating the building, and the couple plans to put on a front porch to match the building’s original look. They expect to have the project done next summer, with a tenant living in the upstairs and the first floor available for offices. This home at 204 West Center St., Medina, was one of 17 houses in the village to receive matching funds for improvements through a grant administered by the Orleans County Chamber of Commerce. The $200,000 grant also provided money to 11 businesses for faÃ§ade and sign upgrades. It has been a busy year for painters in Medina. An anonymous donor offered matching funds for people who painted their houses or worked on other beautification efforts. Contractors worked on 28 properties in all as part of $200,000 in matching grants. The grants will continue in 2014. The Orleans County Chamber of Commerce is administering the program. The grant in its first year funded projects at 17 homes and 11 businesses. The initiative is aimed to boost the curb-side appeal of the community, and make needed improvements more affordable for property owners. The money has given many neighborhoods a lift. Adolf Genter, a member of the Concerned Citizens of Orleans County, protests the sale of the county nursing home. These are apathetic times when it comes to pubic participation in civic affairs. Voter turnout is low. Membership is way down in service clubs, and many political candidates run unopposed. But Kent, a retired social studies teacher, inspired a sustained protest from people of all political parties against the county’s move to sell The Villages of Orleans. They stood in the rain outside Legislature meetings. They carried petitions. They filed lawsuits. The Concerned Citizens raised money at spaghetti dinners. They tried every route possible in voicing their opposition to the sale. That’s what good citizens do: They engage in the process. Gia Arnold speaks at a rally against the SAFE Act in April outside the Orleans County Courthouse. A new movement took off this year, and it was led by a mother of three young children. Gia Arnold of Holley helped create the New York Revolution, a group opposed to the SAFE Act. The group was born after the State Legislature and Gov. Cuomo in January passed the SAFE Act, legislation that NY Revolution saw as an infringement on the Second Amendment rights. The group has a following state-wide but it may be it’s most powerful in Orleans County. Arnold attended numerous community events and municipal board meetings, and swayed every elected board at the village, town and county level to pass resolutions opposing the SAFE Act. A top goal is unseating Cuomo as governor in November 2014. Arnold planned a rally in April attended by about 200 people outside the County Courthouse. Photos by Tom Rivers: Florence Surdi of Albion is recognized on Thursday as one of two outstanding senior citizens from Orleans County who will be honored in Albany on May 22 during an awards program at the State Capitol. Melissa Blanar, director of the Orleans County Office for the Aging, is at left, and State Assemblyman Steve Hawley is at right. KNOWLESVILLE – Three senior citizens in Orleans County were honored on Thursday for their commitment to community service in retirement. 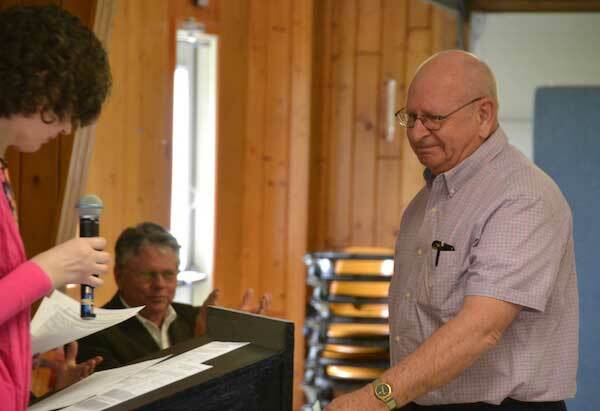 The Orleans County Office for the Aging held its annual Spring Jubilee program to celebrate “Older Americans Month.” About 200 seniors attended the program at the Trolley Building of the Orleans County 4-H Fairgrounds. The OFA accepted nominations for outstanding seniors from the community. An advisory council then picked the two seniors who would represent the county in Albany during an awards program on May 22. Florence Surdi, 88, volunteers with Hospice of Orleans, the American Red Cross, Office for the Aging, Genesee Orleans Ministry of Concern and Holy Family Parish. Surdi worked five years at Kodak before going back to school to earn a nursing degree. She worked in many doctors’ offices in a 35-year career. State Assemblyman Steve Hawley thanks the seniors for their many years of service to the community. Surdi has been a very active volunteer the past 12 years, and is a past winner of Hospice’s “Volunteer of the Year.” At Hospice, she provides companionship to terminally ill patients. She also helps with the administrative office at Hospice. “Florence calmly and efficiently handles any task she is given,” the nominator wrote about Surdi. At the OFA she assists with the newsletter and a volunteer driver. As a driver, she took an elderly man to visit his wife in a nursing home for five years. She also helps the American Red Cross during blood drives. When the Ministry of Concern needs to assemble a mailing, Surdi can be counted on. At Holy Family Parish, she is active with two charitable organizations, the Ladies of Charity and Catholic Daughters. Surdi encouraged more seniors to volunteer, saying she has made many friends in the community through serving the different organizations. Don Snyder of Albion was recognized Thursday for his community service as a senior citizen. Don Snyder has been very busy in retirement, helping church leaders respond to the opioid crisis in Orleans County. Snyder, who is retired as a chaplain in the state correction system, was nominated for the senior citizen award by Sheriff Randy Bower. Snyder was instrumental in setting up the Sheriffs CARE (Community Addiction Rehabilitation Education) as well as an on-call chaplains’ team. He has been active in helping the community establish an addiction recovery program and is a trained recovery coach. 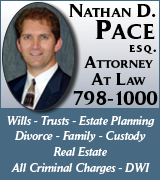 For the past two years he has been a member of the Genesee Orleans Wyoming Opioid Task Force meetings. He also serves on the Orleans County Mental Health Service Board, which oversees delivery of mental health services in the community. He also is a board member for the Oak Orchard Assembly of God in Medina, the Grace House in Buffalo/Saving Grace Ministries, and From the Inside Out Ministries. Snyder also volunteers with the American Red Cross’s Disaster Action Team, responding when people are made homeless, and he participates in Pastors Aligned for Community Transformation. 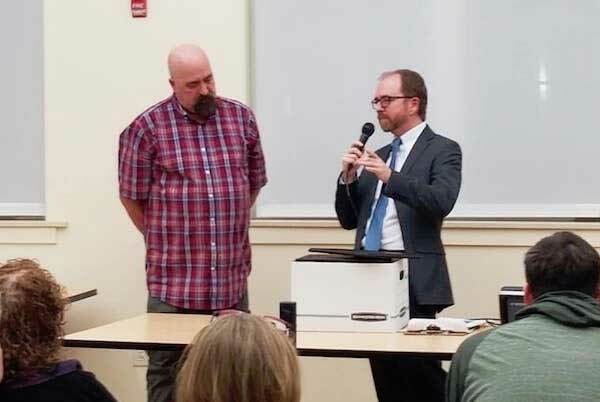 “With our ever growing opiate epidemic, many times hand in hand with mental illness, Don has volunteered his time as well as getting others involved to assist our community to educate and rehabilitate those struggling,” Bower said. Snyder said people need to be involved in community issues, especially when they are a resource or can connect people to resources for help. Patricia Cammarata of Albion receives certificates of commendation for her volunteer service. Snyder and Surdi will both be recognized in Albany for their volunteer work. Patricia Cammarata also was recognized during the Senior Jubilee on Thursday. Cammarata worked as a licensed master social worker in children’s mental health. She volunteers with the Catholic Charities Friendly Phones Program, and has been a trustee on the Swan Library Board of Trustees and a member of the Albion Historic Preservation Commission. She was nominated for the award by Catholic Charities. 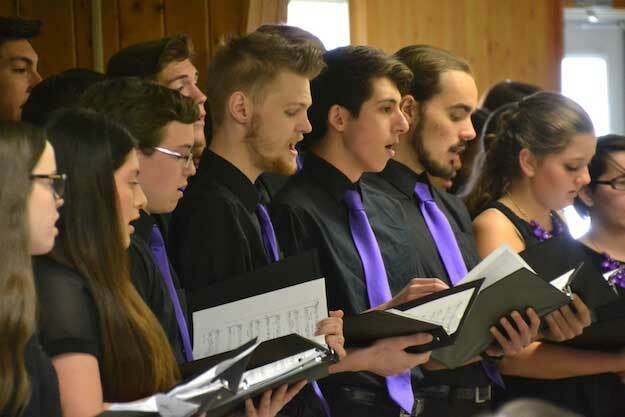 The Albion High School Women’s and Men’s Select Chorus performed several songs for the seniors. The group has about 40 members and is led by director Gary Simboli. 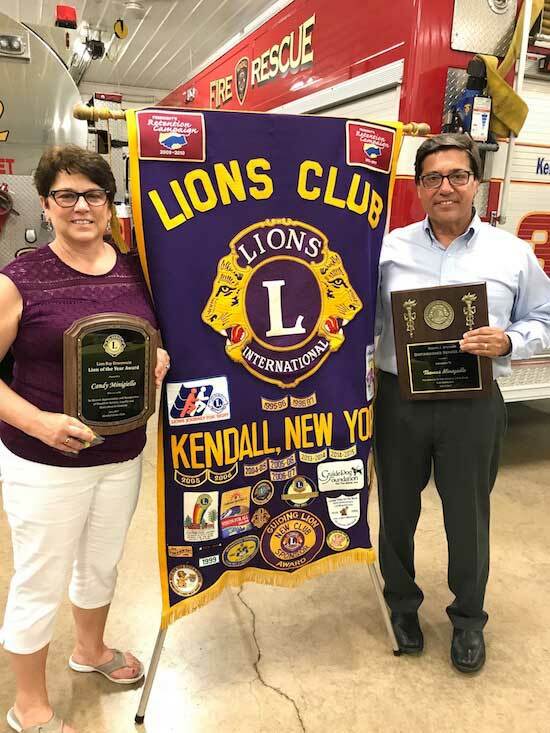 Provided photos: Bill and Dorrie Hardenbrook were honored as Citizens of the Year by the Kendall Lions Club on Thursday. They are pictured with John Becker, right, a member of the Lions Club. 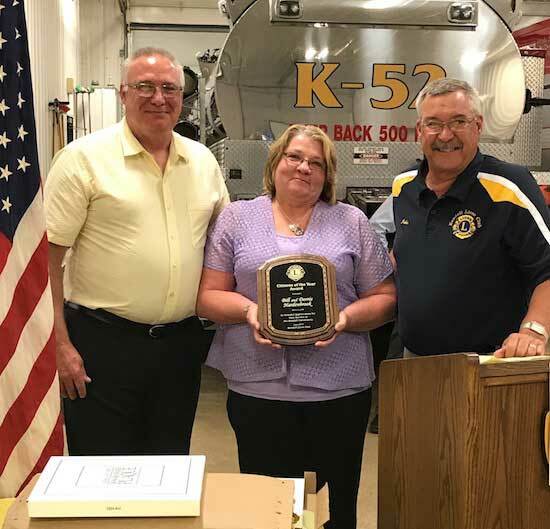 KENDALL – The Kendall Lions Club held its annual Officer Installation and Awards dinner on Thursday at the Kendall Fire Hall. The Lions Club honored Bill and Dorrie Hardenbrook as as Citizens of the Year. The Hardenbrooks were honored for their extensive service to the community especially through their many years of work with the Kendall Fire Department and Ladies Auxiliary. The Lions honored Kendall Highway Superintendent Warren Kruger (left) with a special Appreciation Award for his outstanding service to our community with special thanks for his leadership in the recent windstorm and lakeshore emergencies. He is pictured with Tony Cammarata, the Town Supervisor and Lions Club member. Lion Candy Minigiello was honored as Lion of the Year for her service to the club and community. She is pictured with Lions Club President Tom Minigiello. 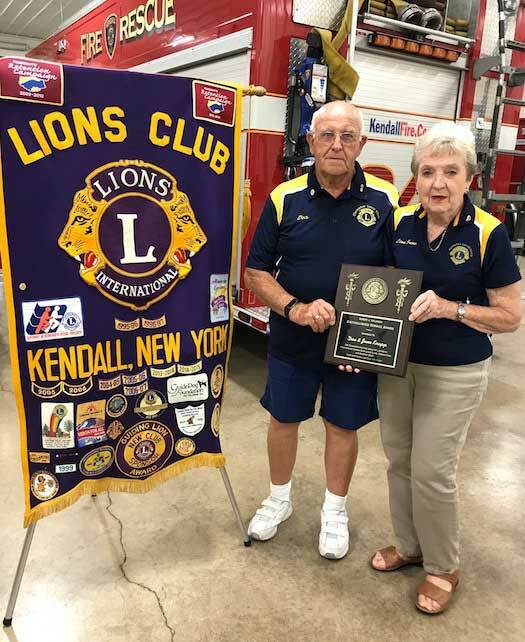 The highest award available for the Lions Club in New York State, the Robert J Uplinger Distinguished Service Award, was presented to Lions Don and June Knapp and outgoing president Lion Tom Minigiello. These honorees poses the highest examples of Lionistic character, ideals, purpose and service. Lion Don Knapp, a member of the Clarendon Lions Club and his wife June, a member of the Kendall Club are Lion’s Lions. In addition to exemplary service to their own clubs and several other local clubs they are active at both the district and state levels. During the winter months while living in Florida the volunteer their service to the Bradenton Lions Club. 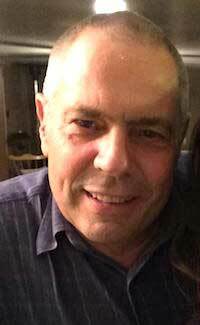 Tom Minigiello, the club’s outgoing president, quickly assumed a leadership role after joining the Kendall Lions Club. He served two terms as president as well as being an active participant in club service. Governor Andrew M. Cuomo announced the Empire Star Public Service Award – a $5,000 professional development scholarship for public employees who have distinguished themselves through meaningful contributions to state government and have demonstrated their dedication to serve with a high level of performance, integrity and pride. New York State’s public workforce is comprised of a diverse and dedicated group of remarkable men and women who provide invaluable services to millions of their fellow New Yorkers every day. From plow drivers, to home health aides, to first responders, engineers, nurses, research scientists, and more, this workforce boasts many of the nation’s best and brightest professionals. While every employee’s contribution is important and appreciated, many individual contributors often stand-out by exceeding what is simply expected of them in their day-to-day work as well as in unforeseen circumstances and emergencies. The Empire Star Public Service Award will highlight the significant contributions that our public employees make to enhance the quality of life for the citizens of New York; strengthen employee engagement and commitment to their jobs; provide management with a new tool to acknowledge the significant contributions that our public employees make every day; as well as promote New York State as an employer that recognizes the contributions of its workforce. Individuals or teams will be nominated by their fellow state employees via the Empire Star Public Service Award website and an Awards Selection Committee will review all nominations and recommend winners to the Governor. Empire Star awardees may use their scholarship for professional development, which can include participating in advanced training via classroom or on-line courses, matriculating in college or community college classes that will benefit them in their current public employment, as well as for materials and equipment to support additional training.